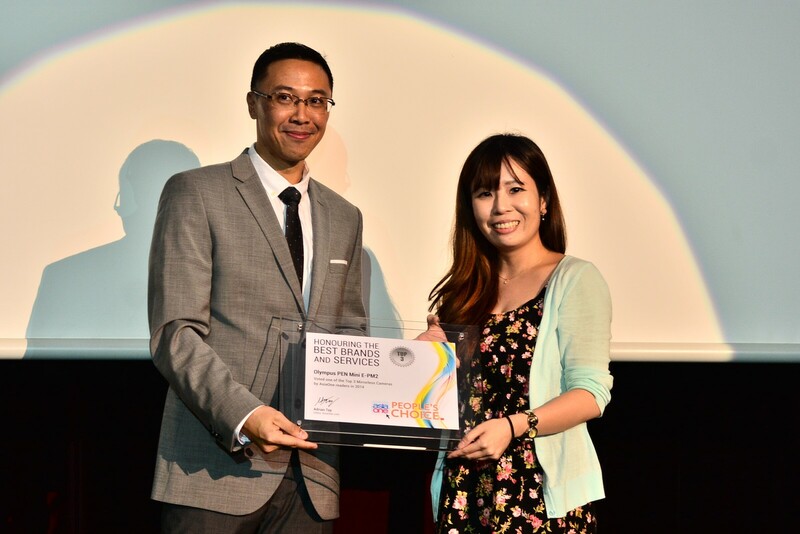 SINGAPORE - VivoCity shopping mall is Singaporeans' top pick for Best Family-Friendly Shopping Centre - a new category at this year's AsiaOne People's Choice Awards. 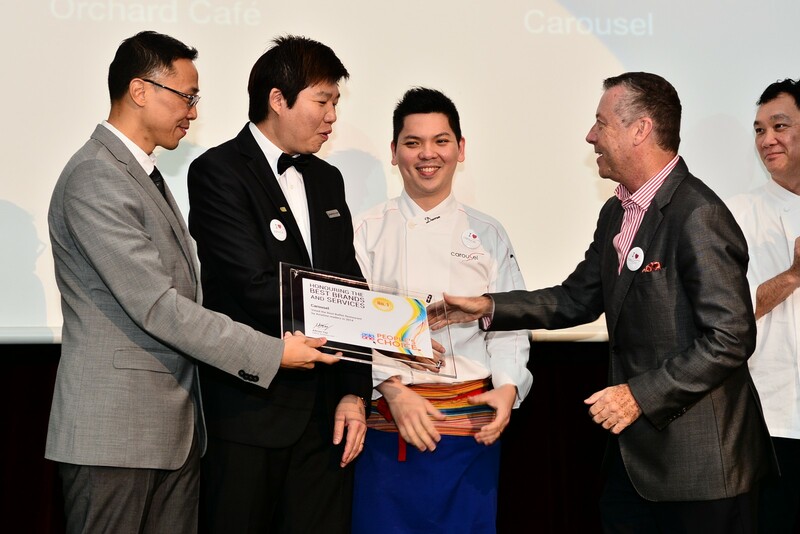 Held for the 6th year running on Wednesday, April 23, the Awards is an annual event to recognise the best brands as voted by the public. 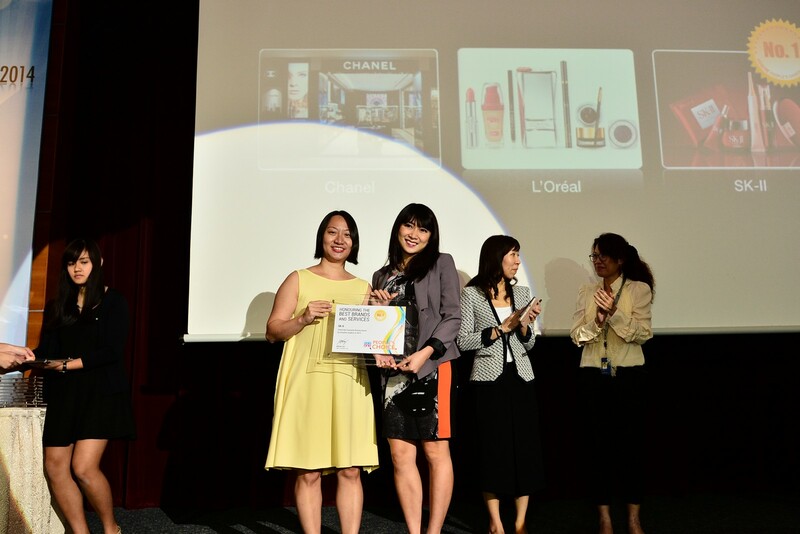 Skincare brand SK-II retained its position as Singaporeans' favourite beauty brand, edging out tough competition from Chanel and L'Oreal, the other contenders for the top award. 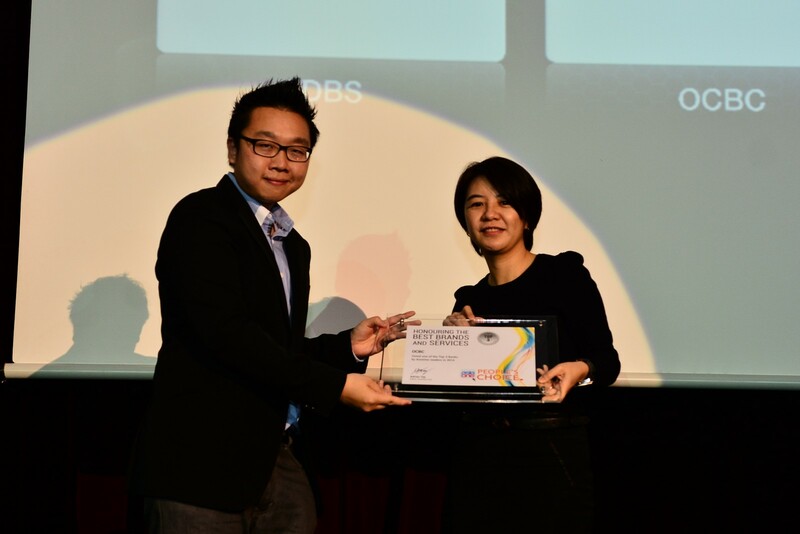 More than 200,000 votes were cast over a three-month period in the 28 categories, ranging from Best Fitness Provider, Best Credit Card, to Best Chinese Restaurant. 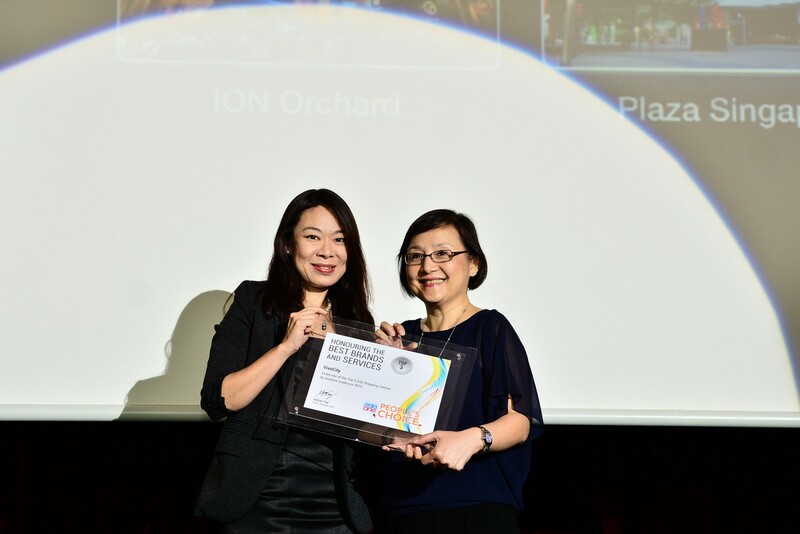 ION Orchard was voted overall winner in the Best Shopping Centre (City) category, while City Square Mall was AsiaOne readers' choice for Best Shopping Centre (Suburbs). 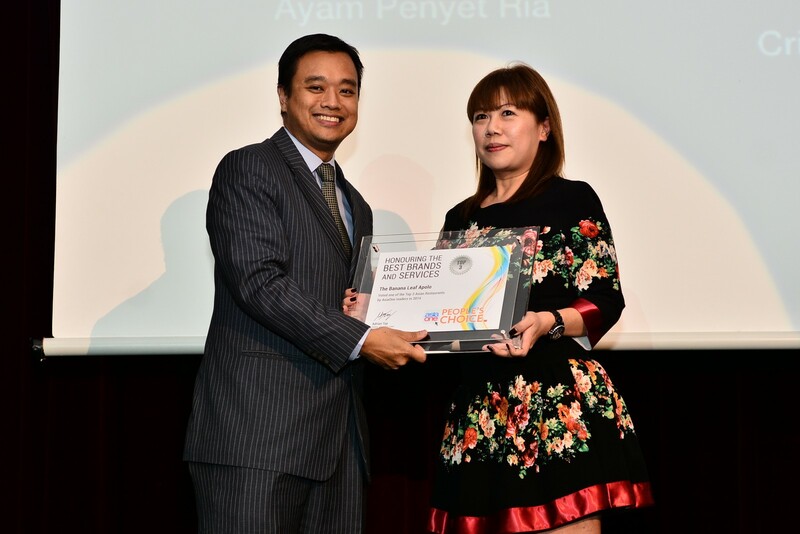 More than 200,000 votes from the public were cast over a three-month voting period for the 300 nominations over 28 categories. 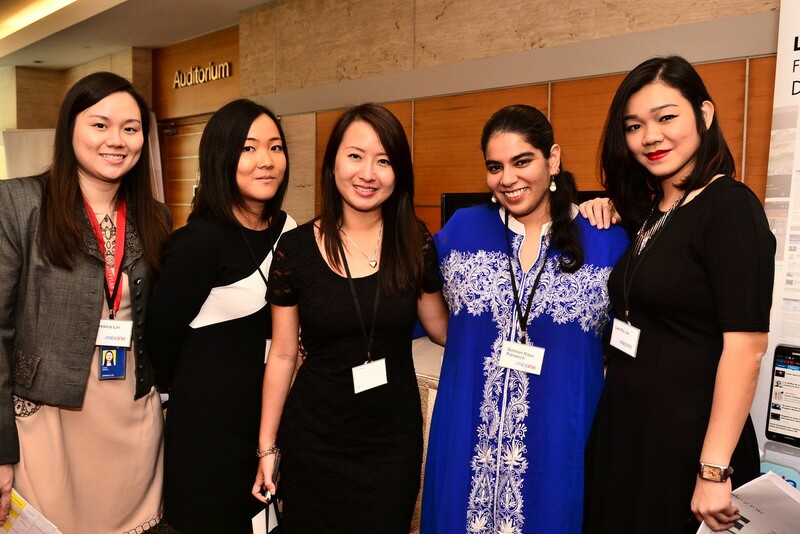 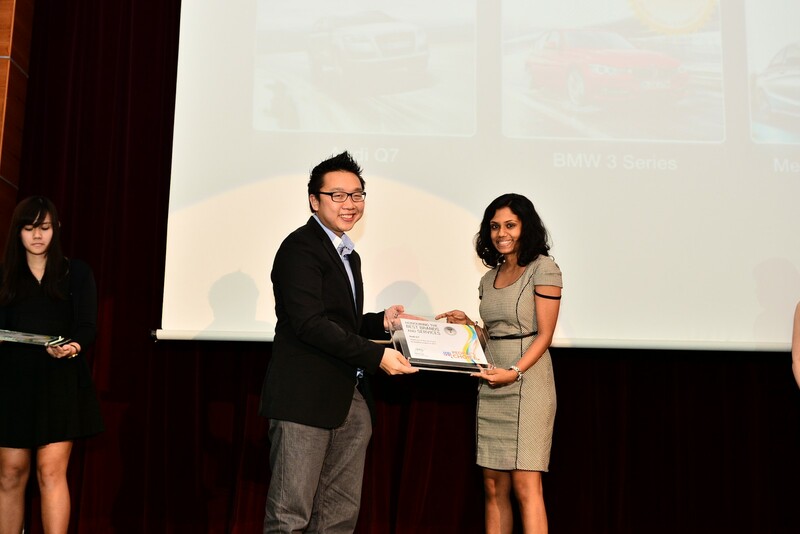 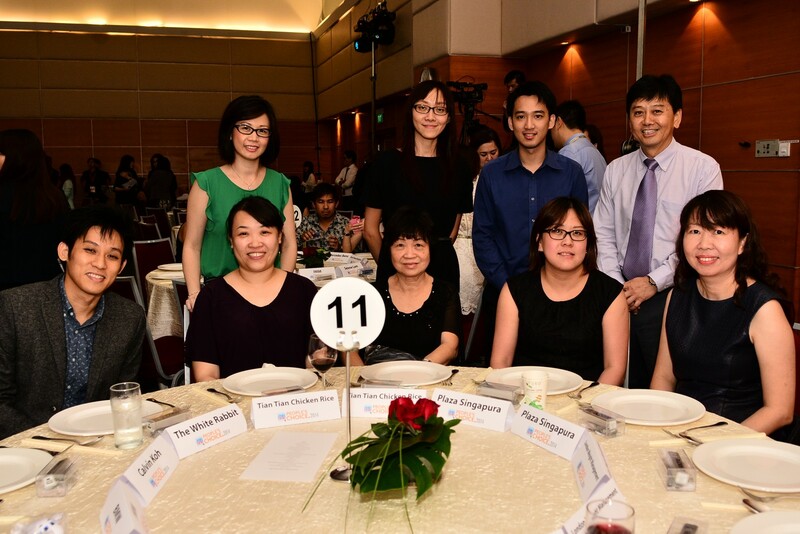 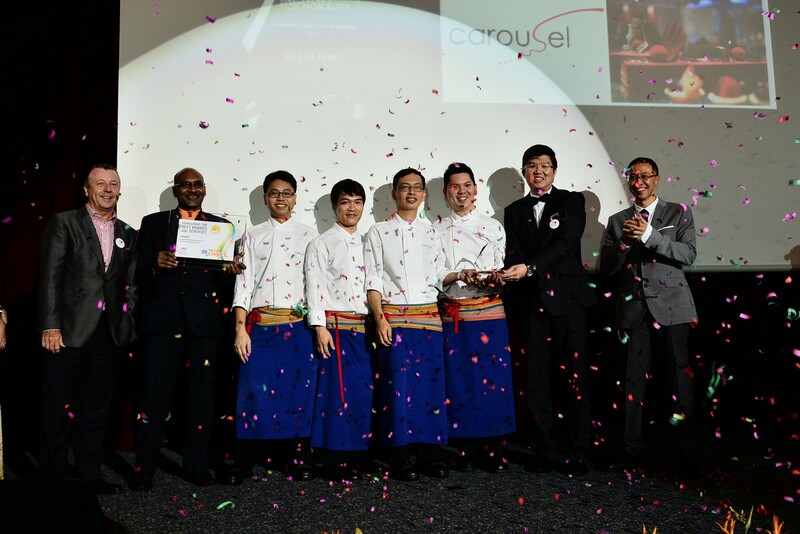 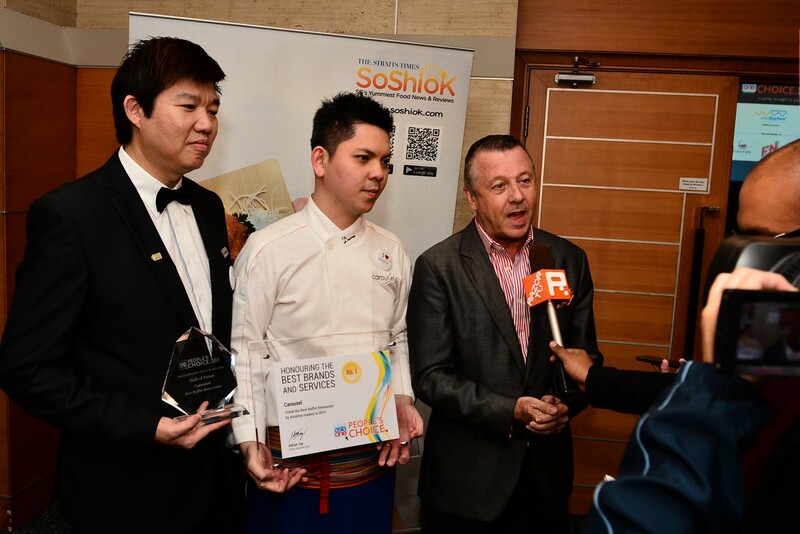 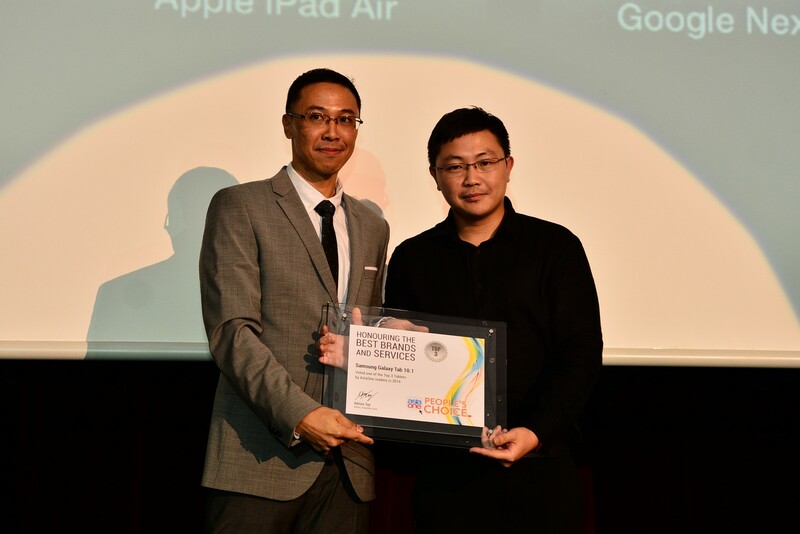 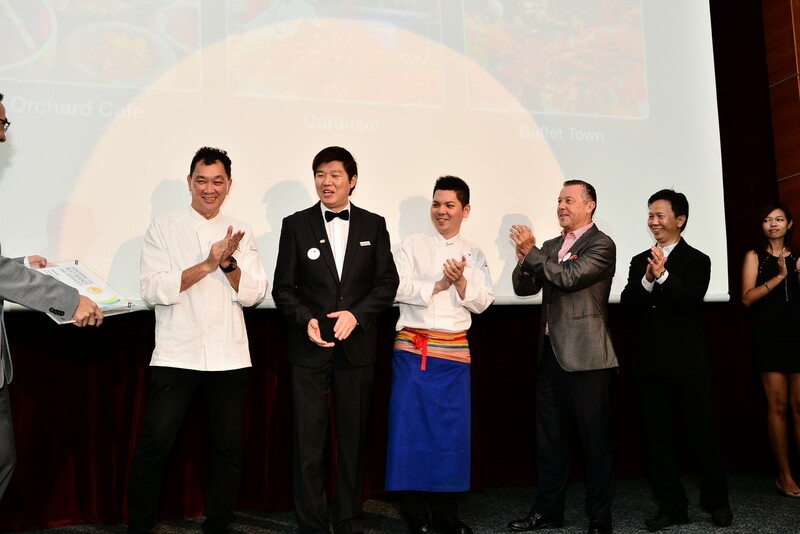 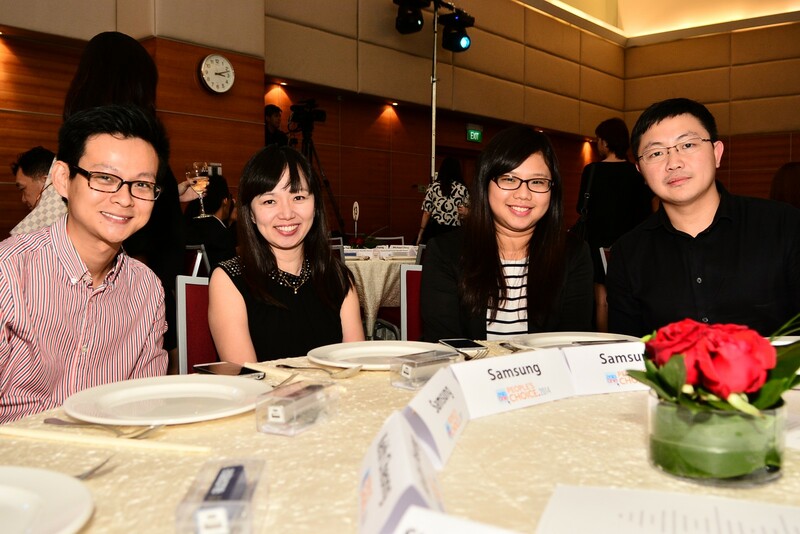 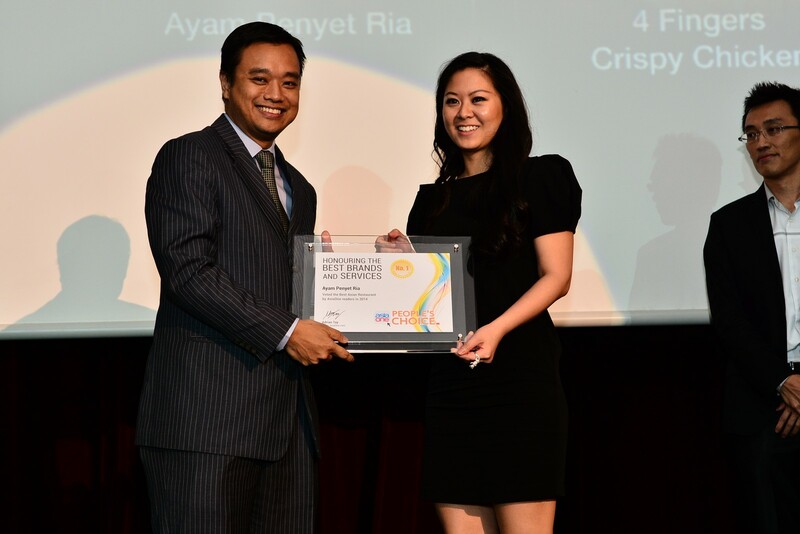 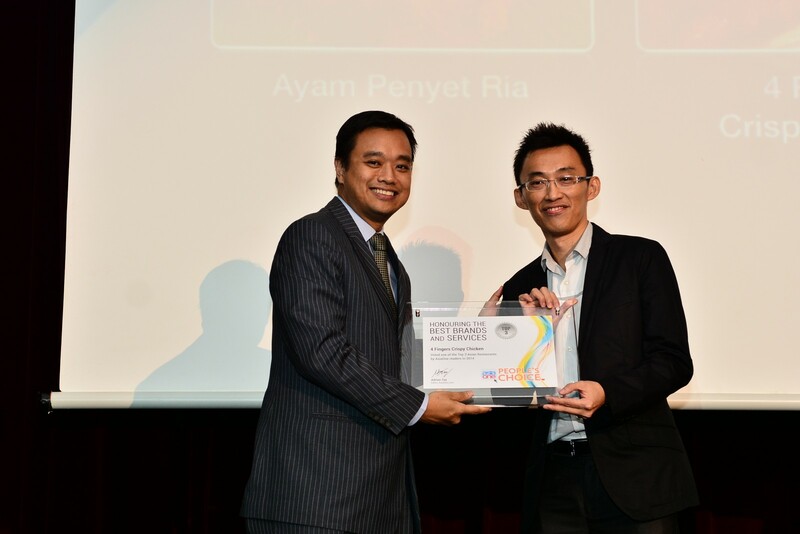 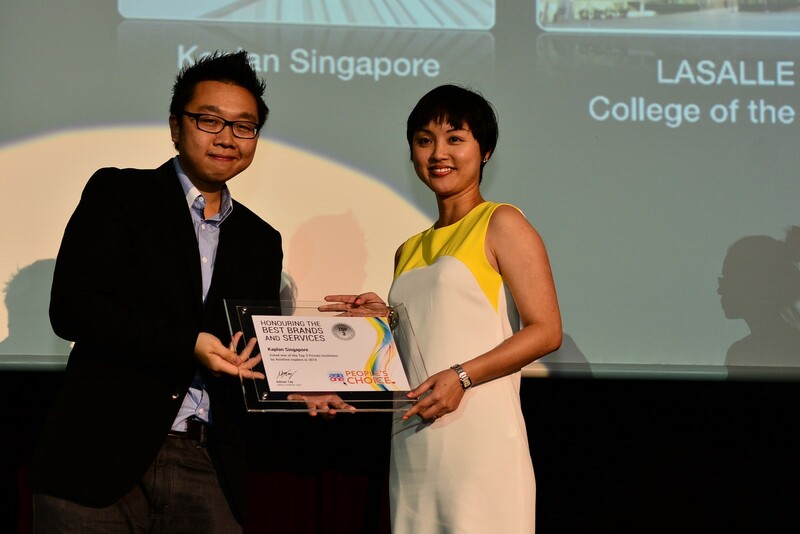 For more information and the full list of winners, please visit www.asiaone.com/pca. 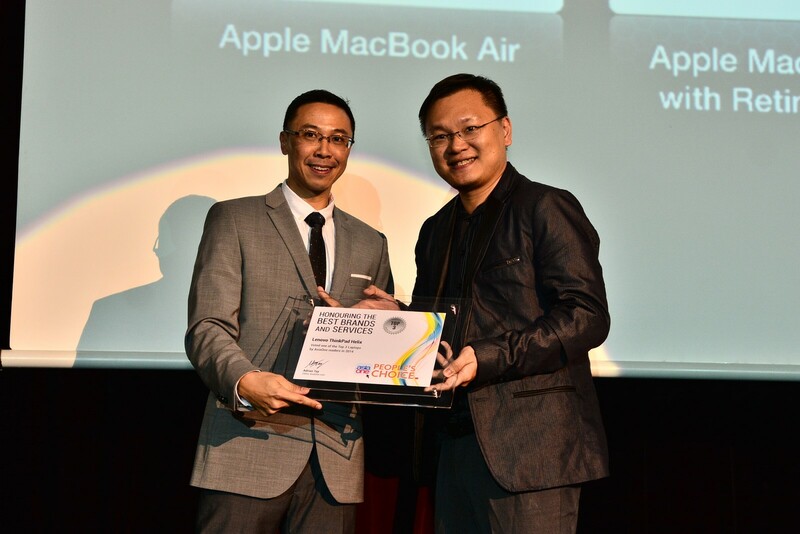 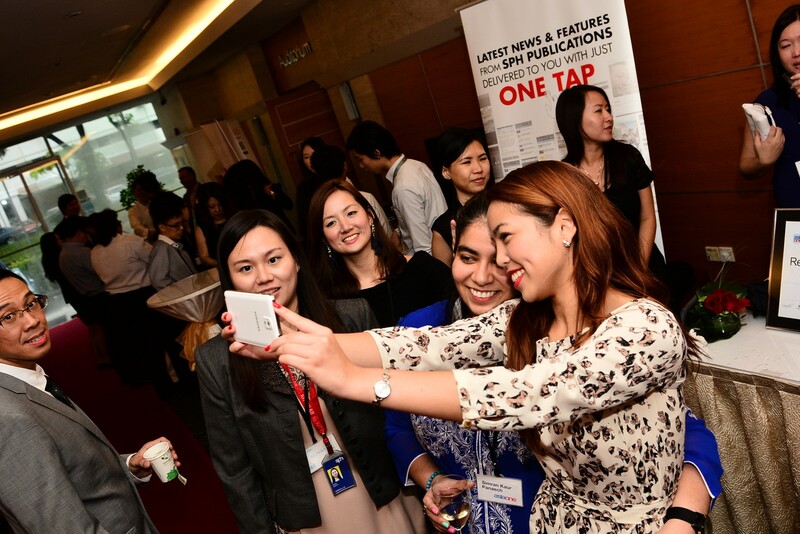 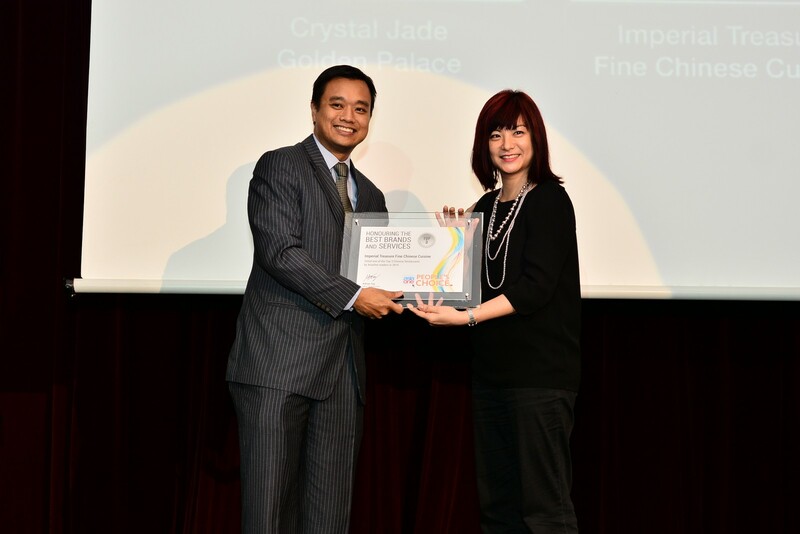 Over 80 awards were given out today to companies of consumer products and services at the AsiaOne People's Choice Awards 2014. 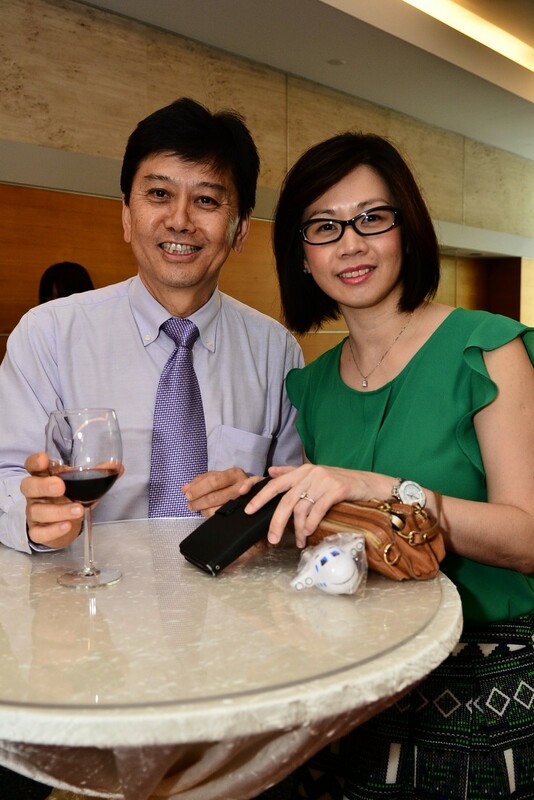 Guests at the pre-event cocktail reception were entertained by the music from vocal band Jewel 4+1. 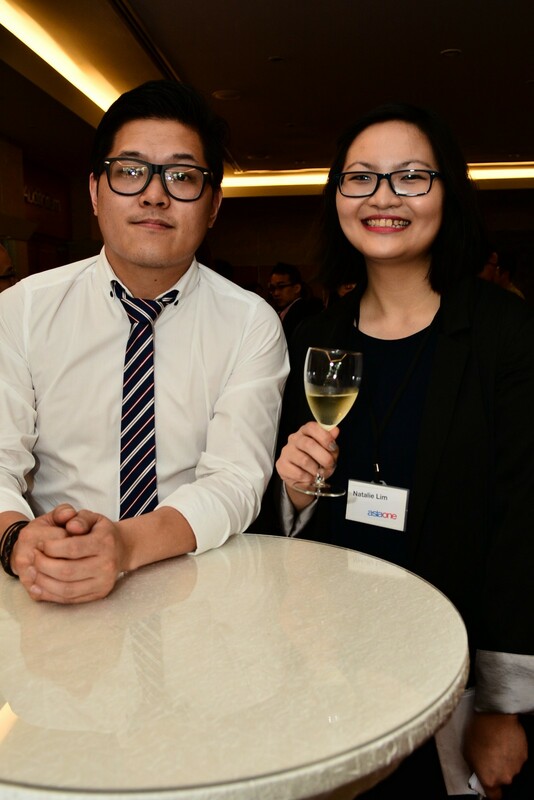 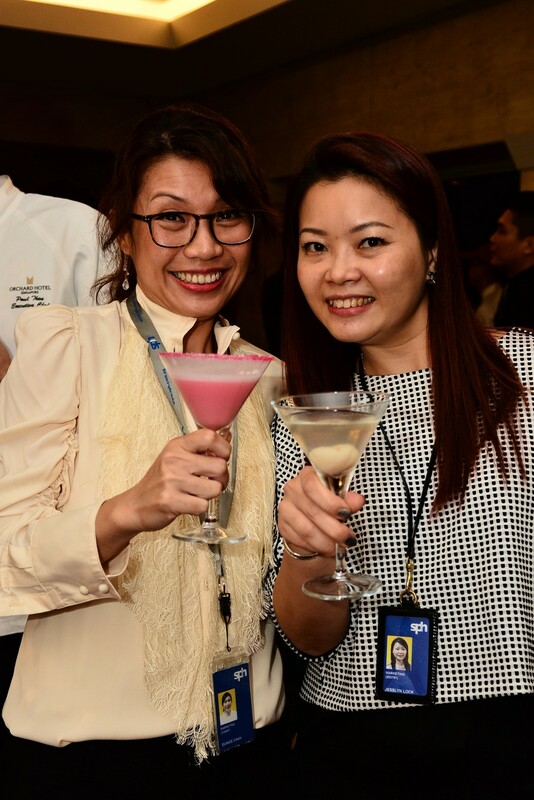 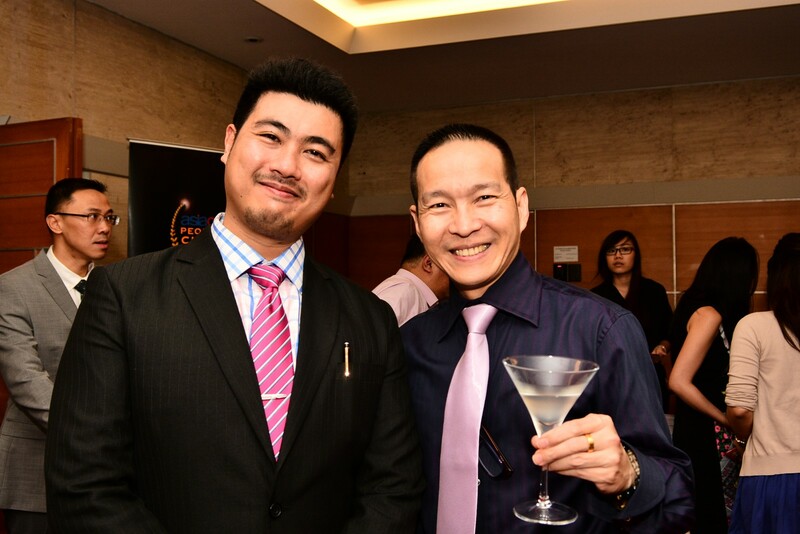 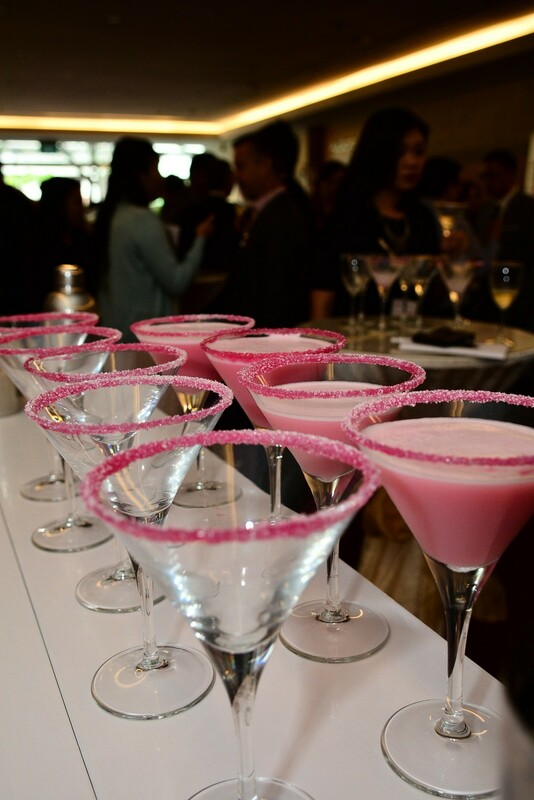 The cocktail bar at the AsiaOne People's Choice Awards 2014. 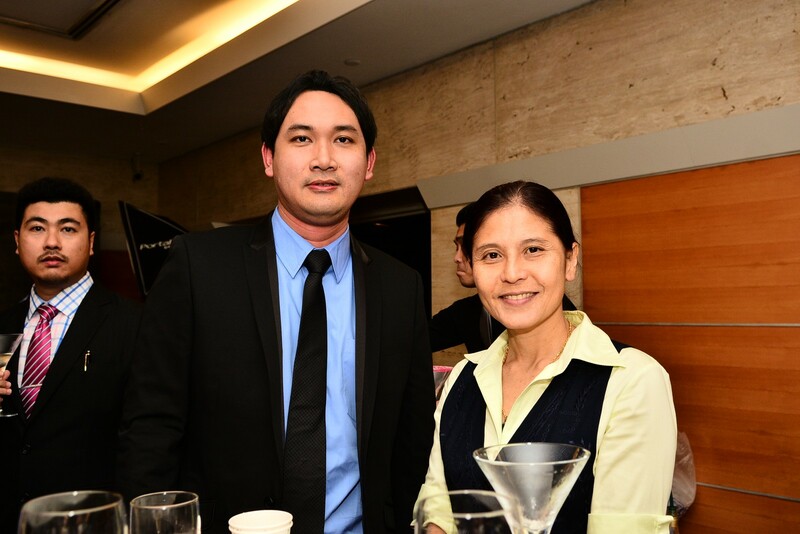 Coffee and tea served by sponsors Puro Fairtrade Coffee Singapore. 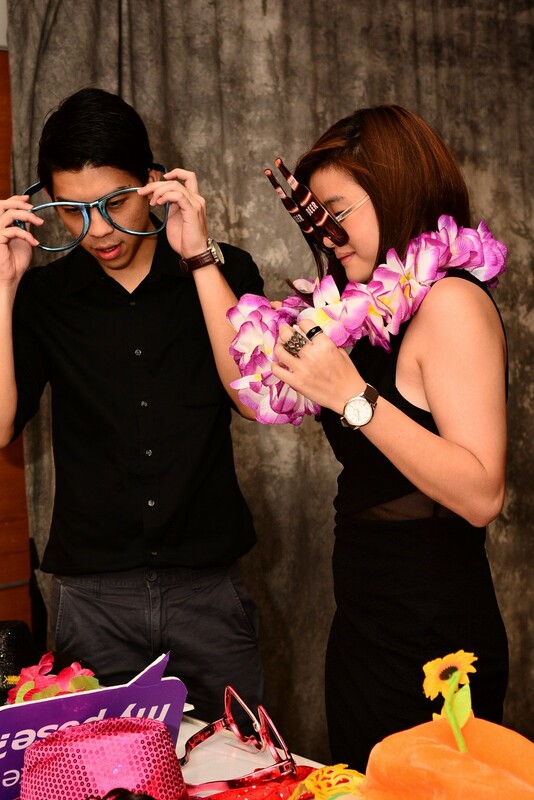 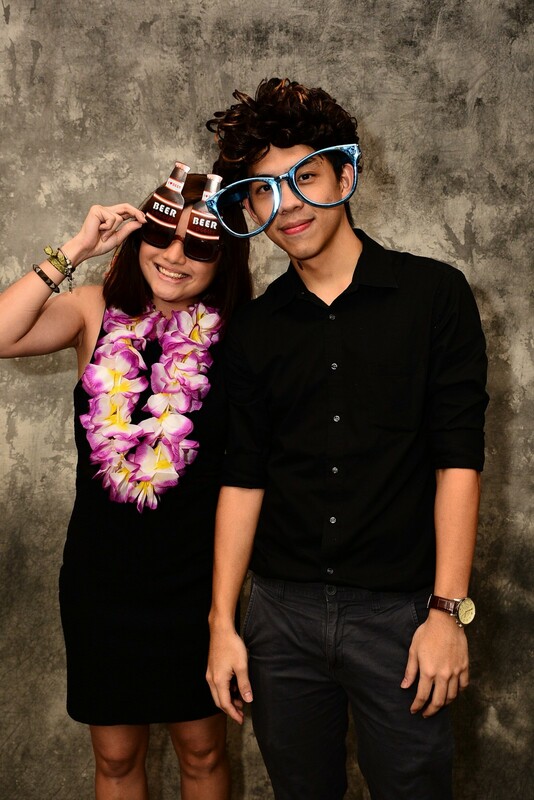 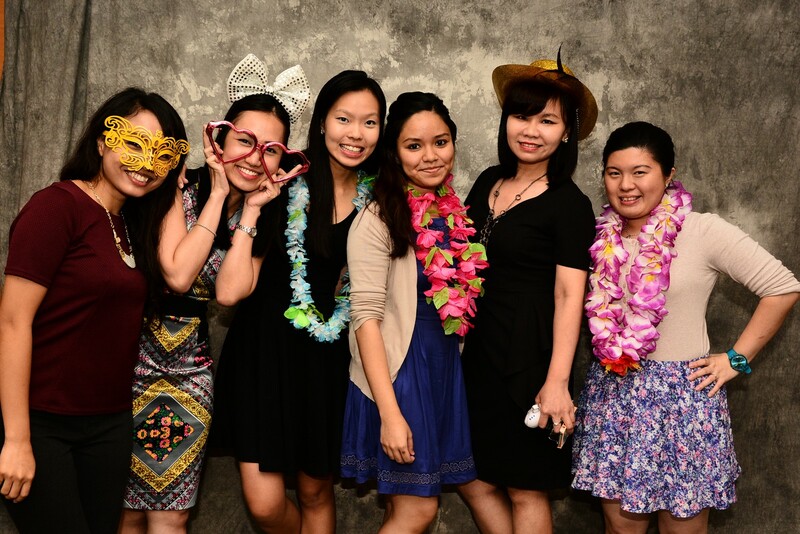 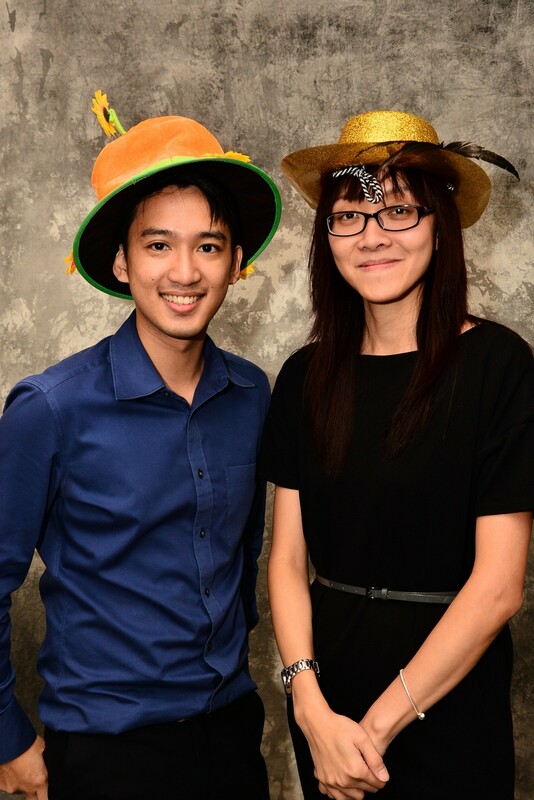 Event participants having fun at the photo booth. 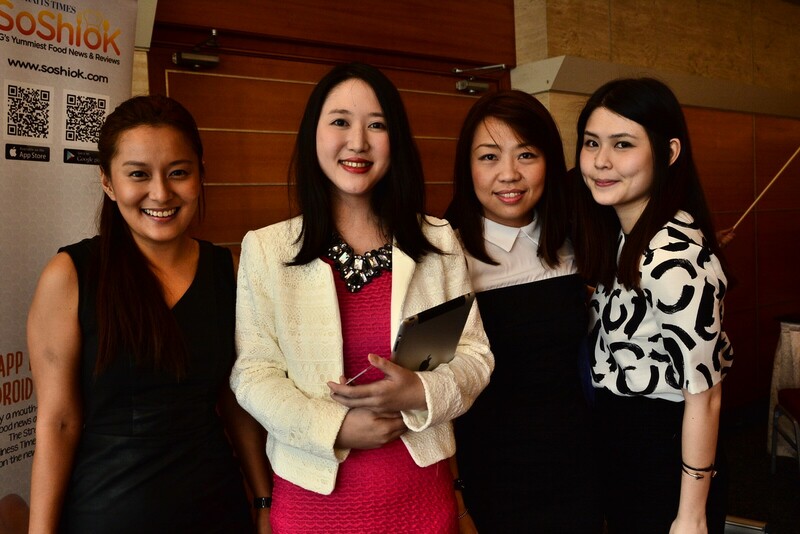 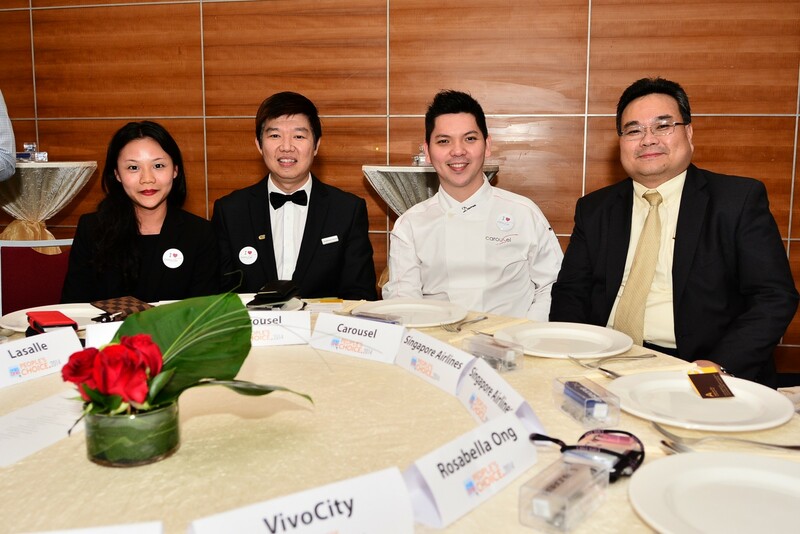 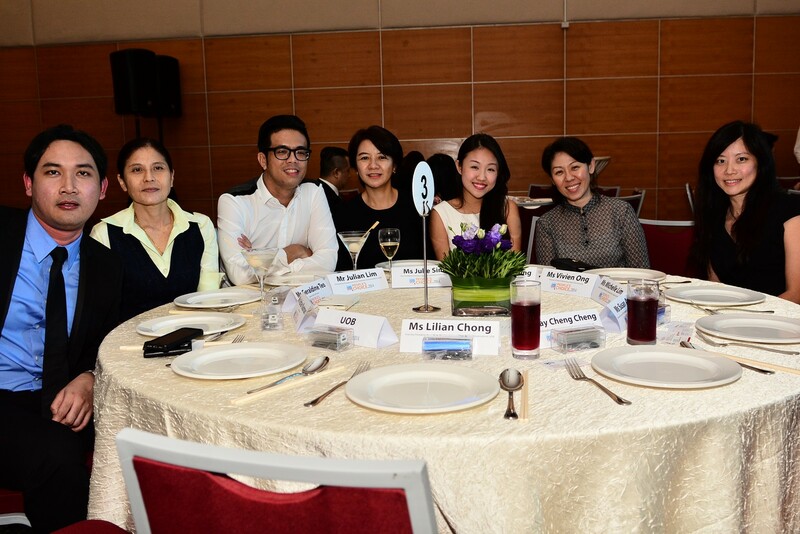 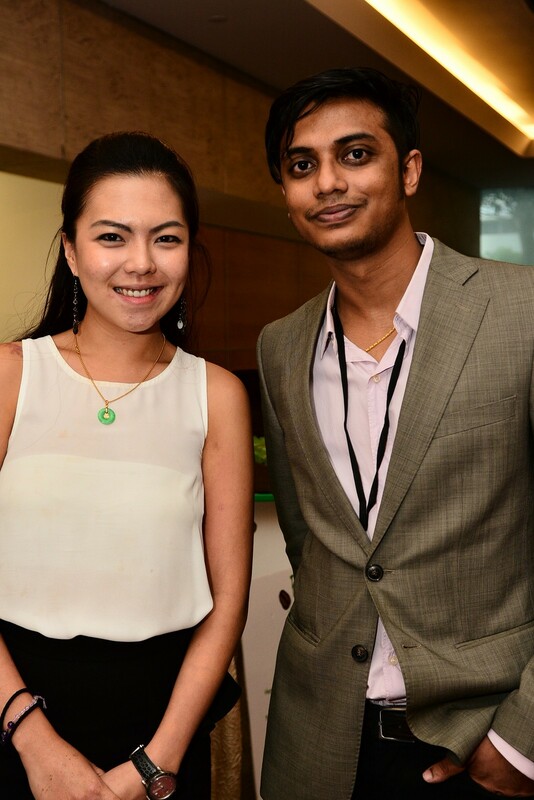 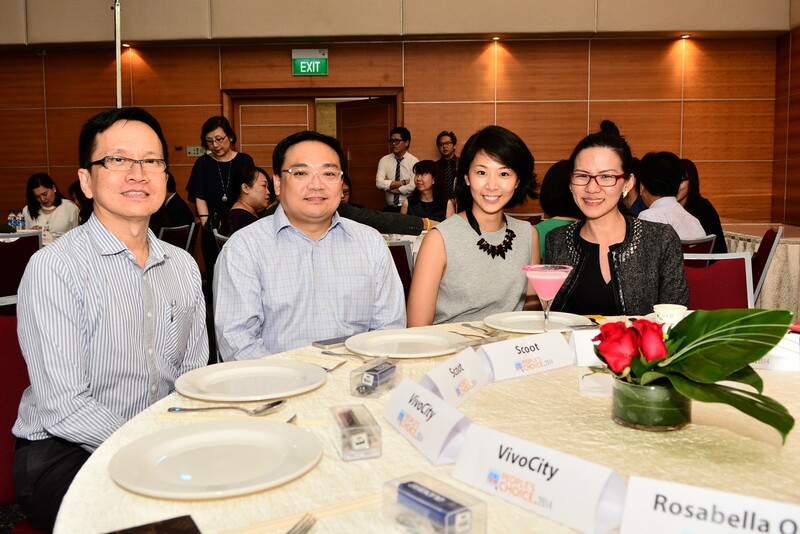 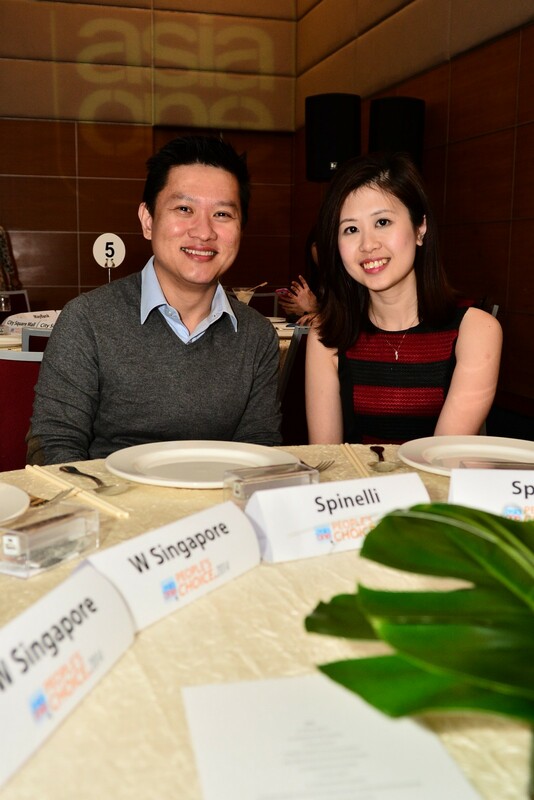 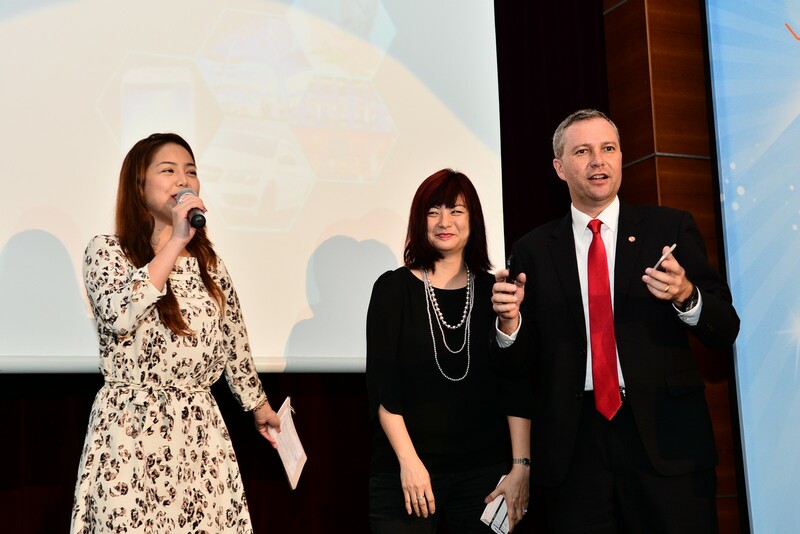 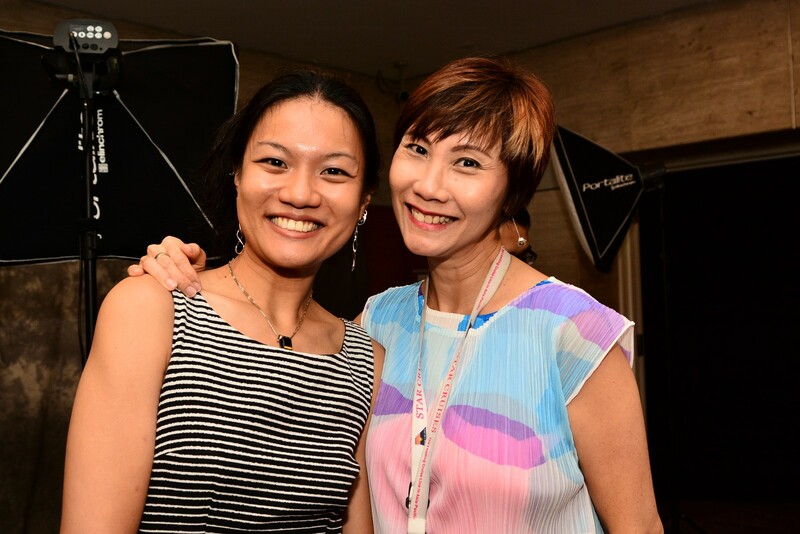 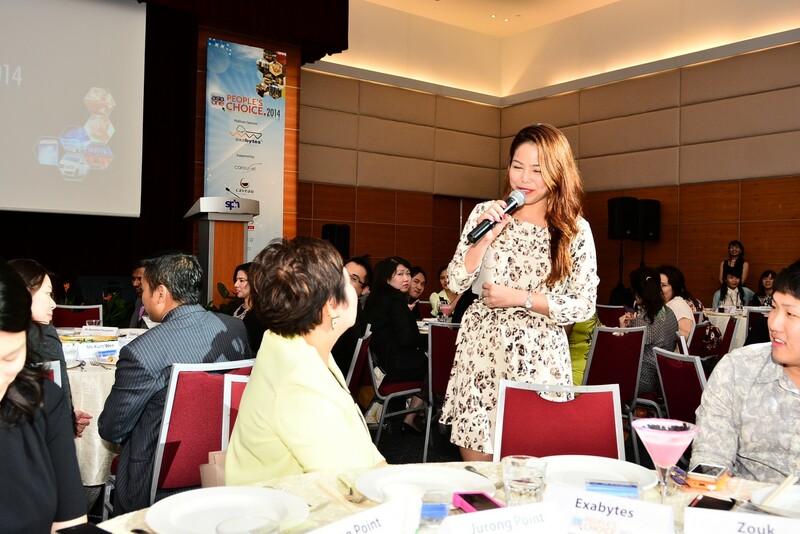 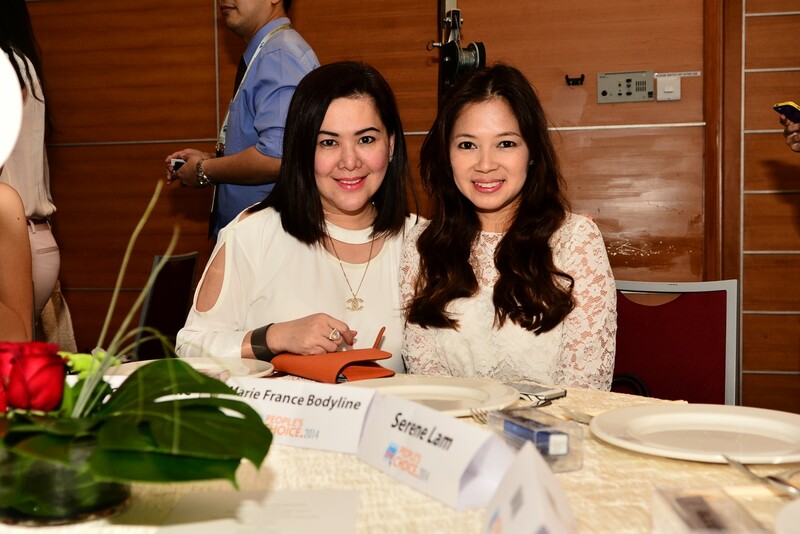 Singapore emcee and radio personality Charmaine Yee hosted the event. 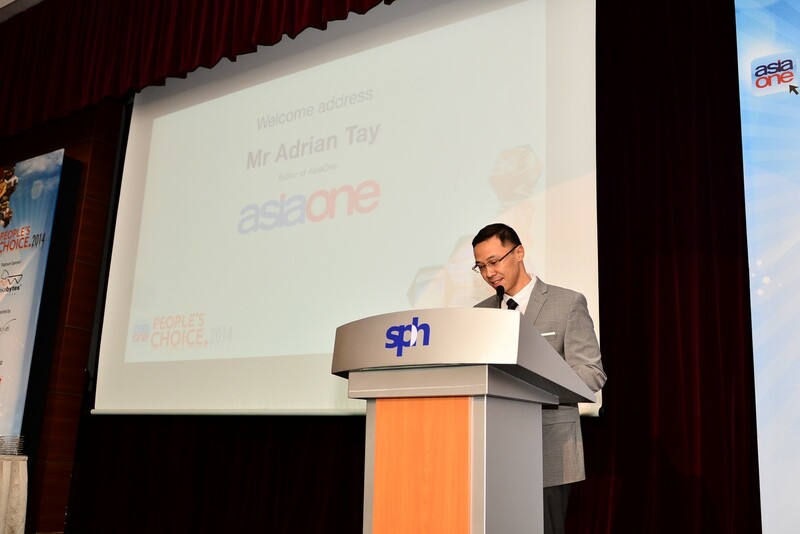 Editor of AsiaOne Mr Adrian Tay takes the stage to give the welcome speech. 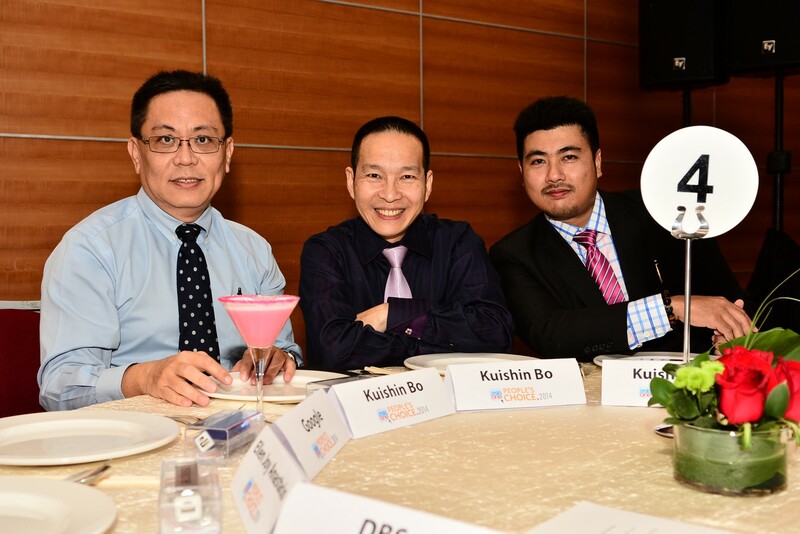 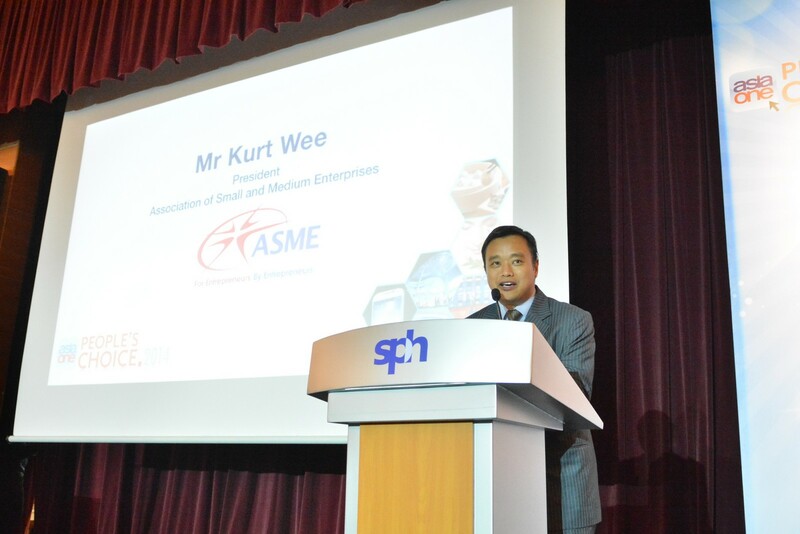 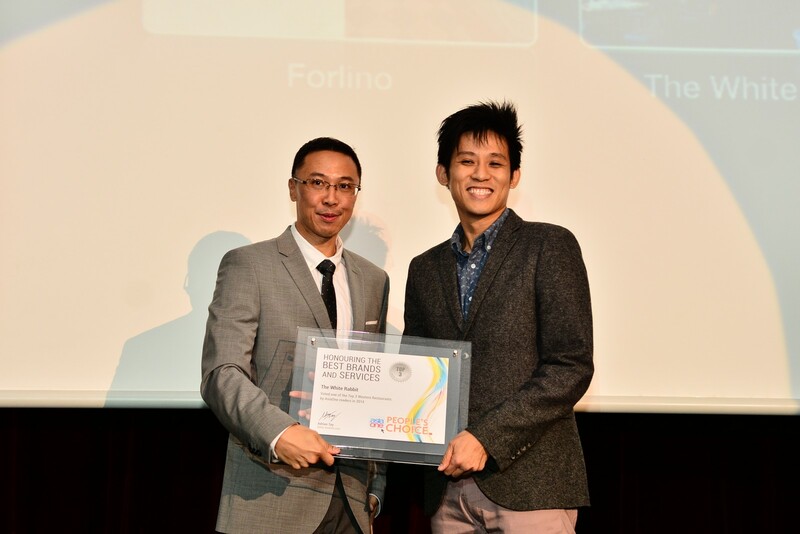 The event was graced by the Guest-of-Honour for the awards, Mr Kurt Wee, President of the Association of Small and Medium Enterprises (ASME). 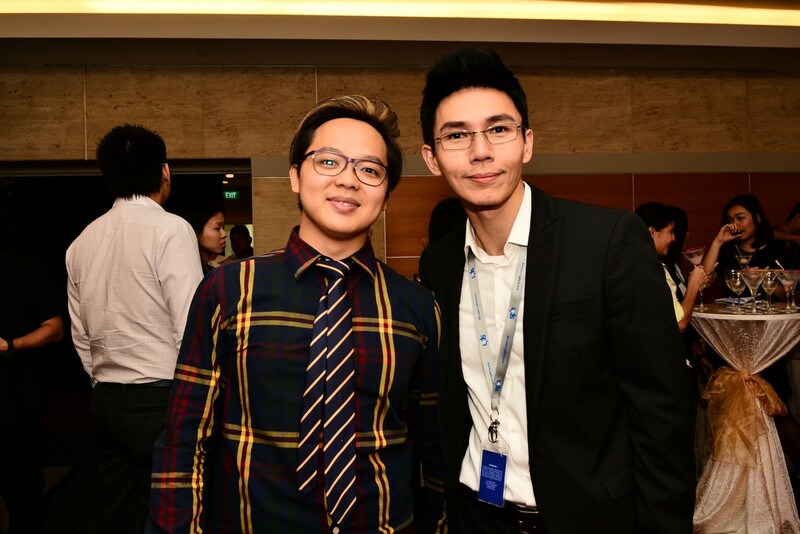 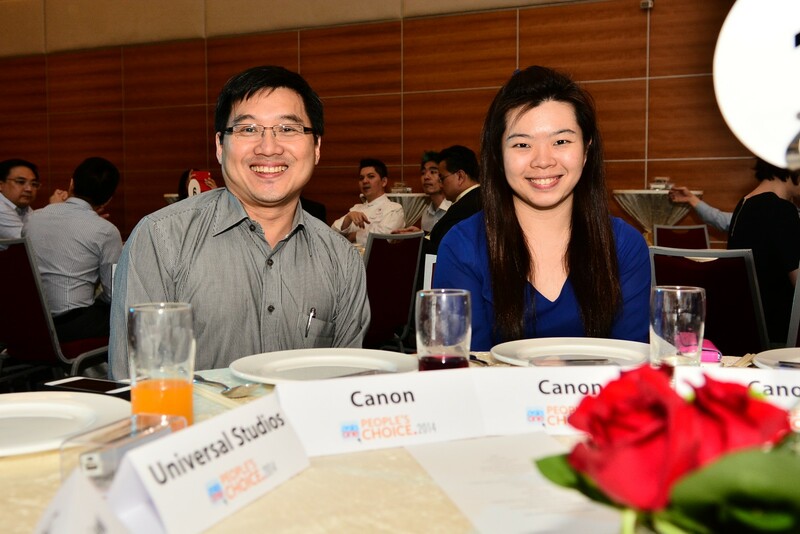 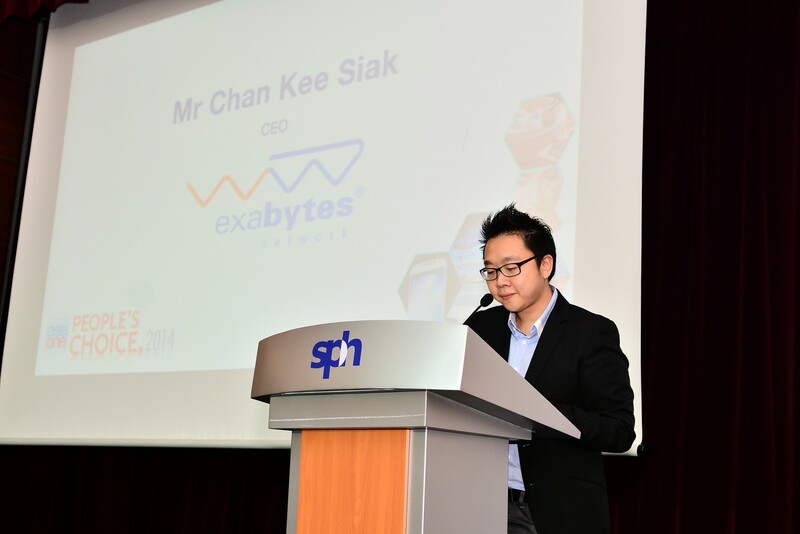 CEO of Exabytes, Mr Chan Kee Siak. 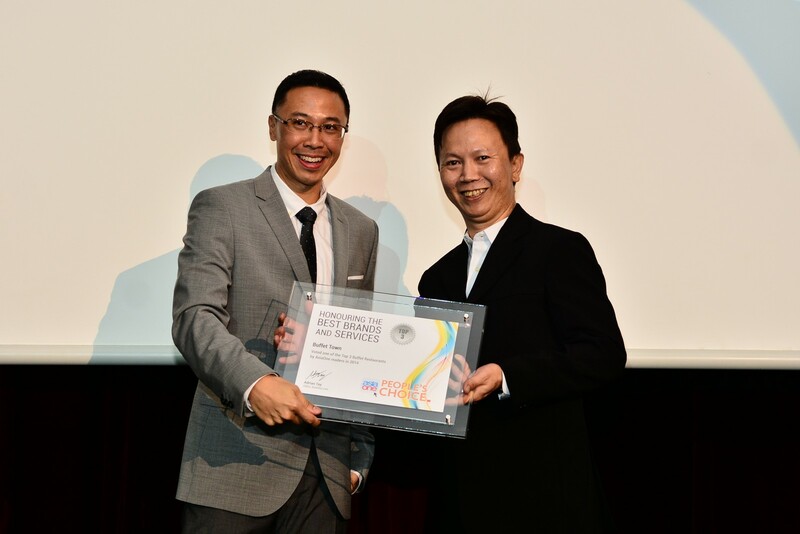 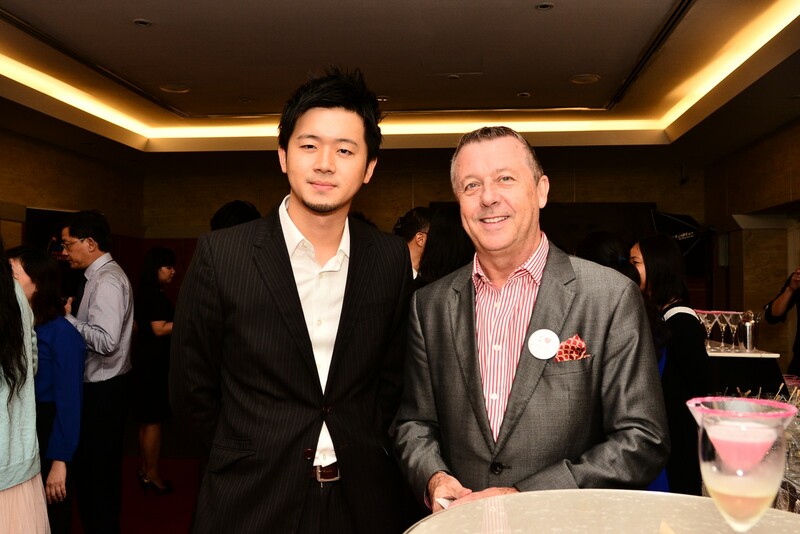 Commenting on why his company chose to sponsor the AsiaOne People's Choice Awards 2014, Mr Chan Kee Siak, CEO of Exabytes Network (Singapore) Pte. 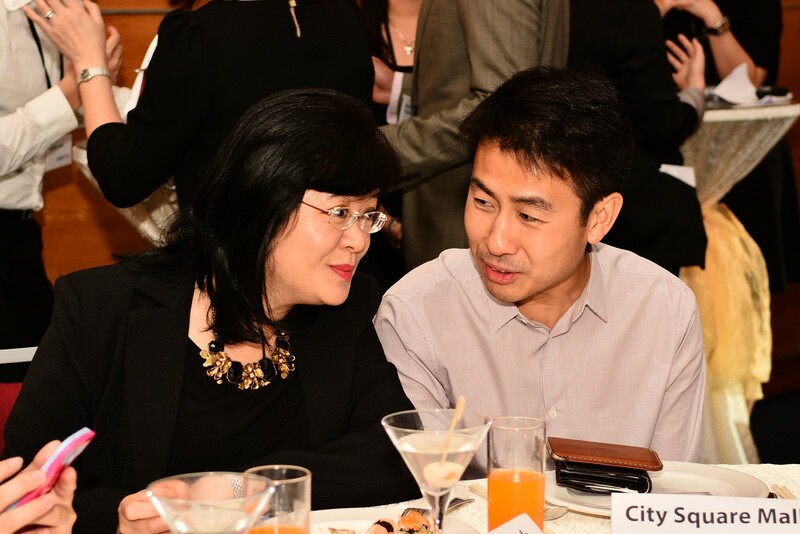 Ltd, said: "We always need recommendations as there are so many options out there. 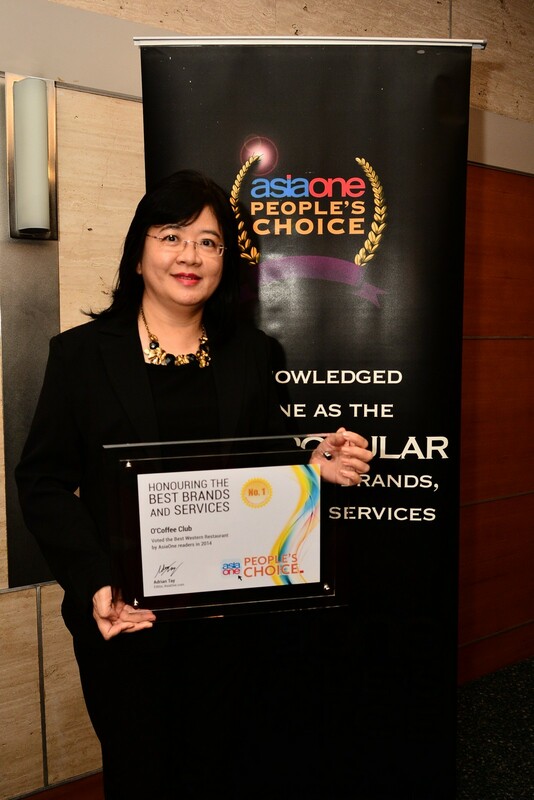 The AsiaOne People's Choice Awards stands out as one of the neutral sources for recommendations, voted by the people, for the people. " 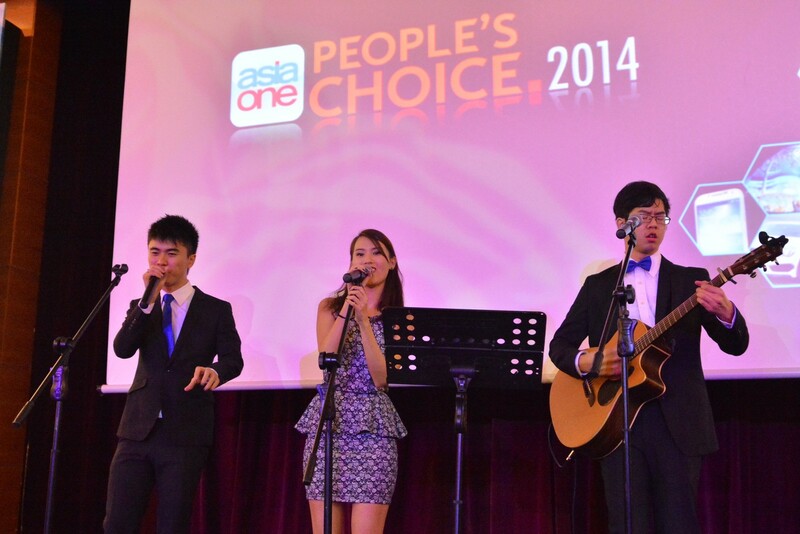 Home-grown band HubbaBubbas performing on stage. 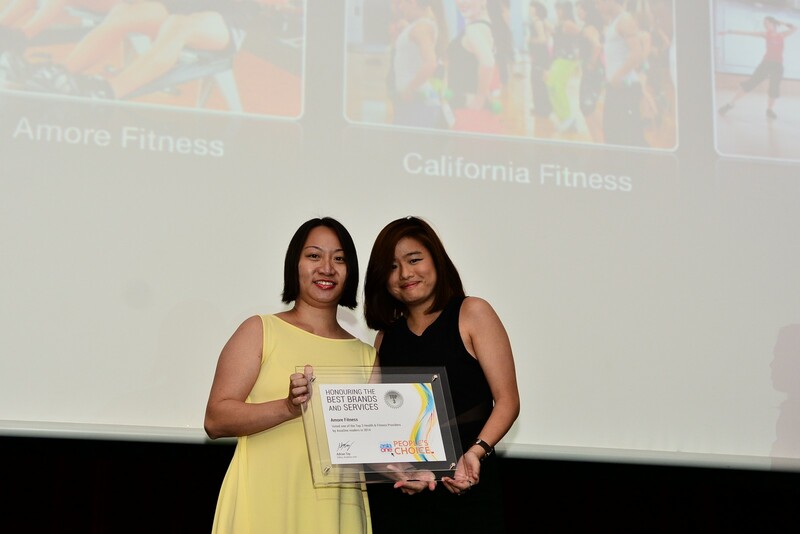 The awards presentation kicked off with Deputy Editor of AsiaOne Ms Cynthia Loh giving out the awards for the Top 3 Health & Fitness Providers - Amore Fitness, Fitness First and California Fitness. 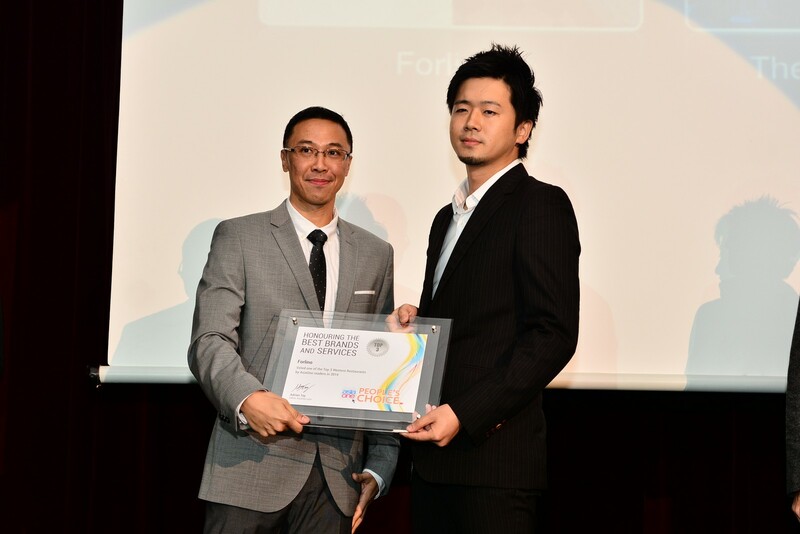 The Best Health & Fitness Provider award went to California Fitness. 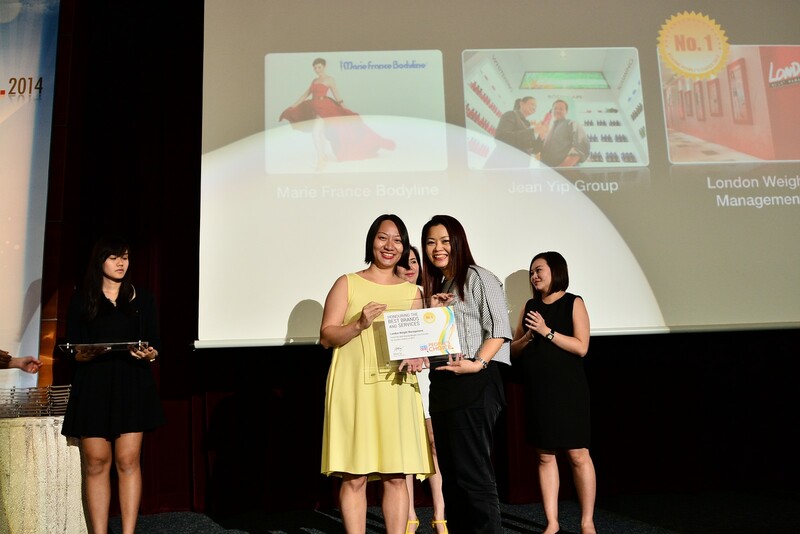 Pictured: Amore Fitness taking the stage to collect their award. 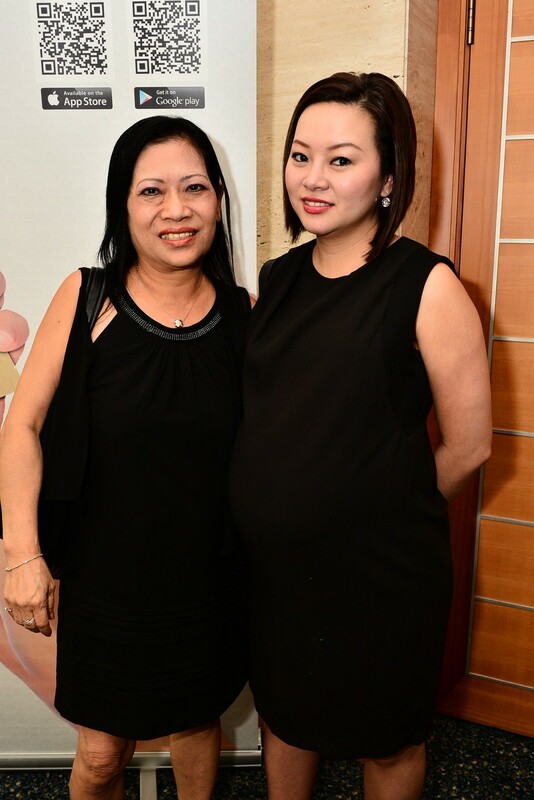 Best Beauty/Weight Loss Provider: London Weight Management. 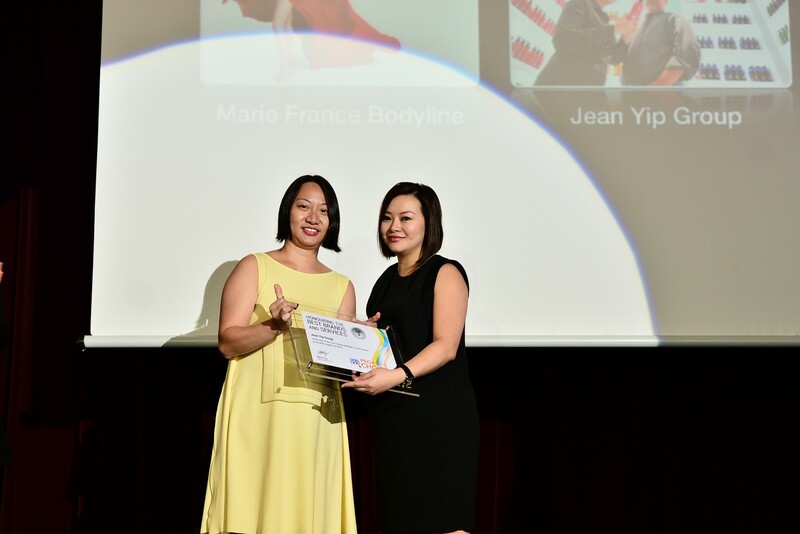 Top 3 Beauty/Weight Loss Provider: Marie France Bodyline. 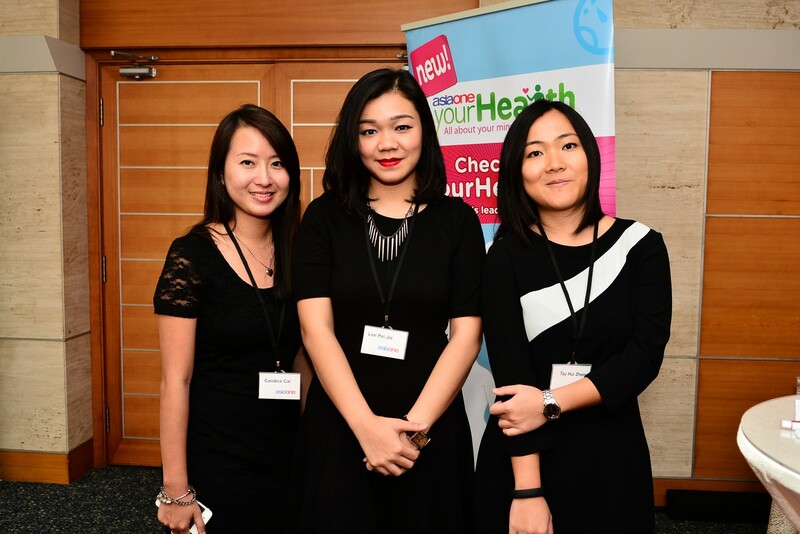 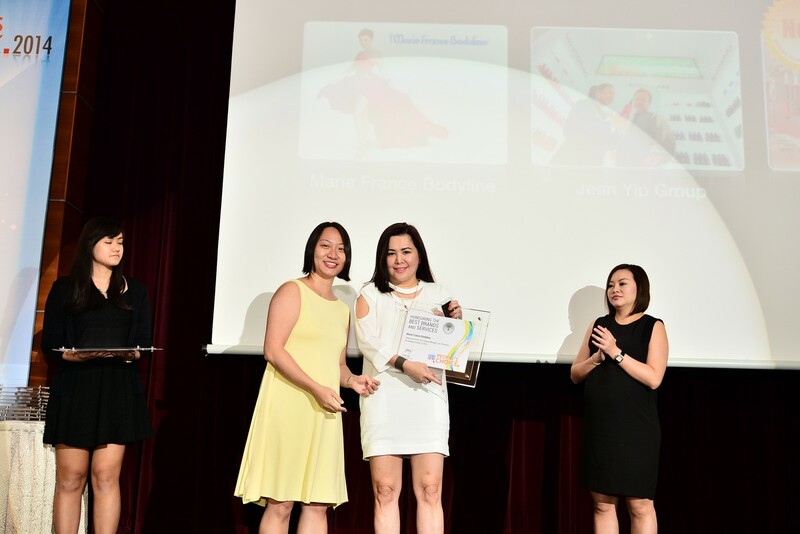 Top 3 Beauty/Weight Loss Provider: Jean Yip Group. 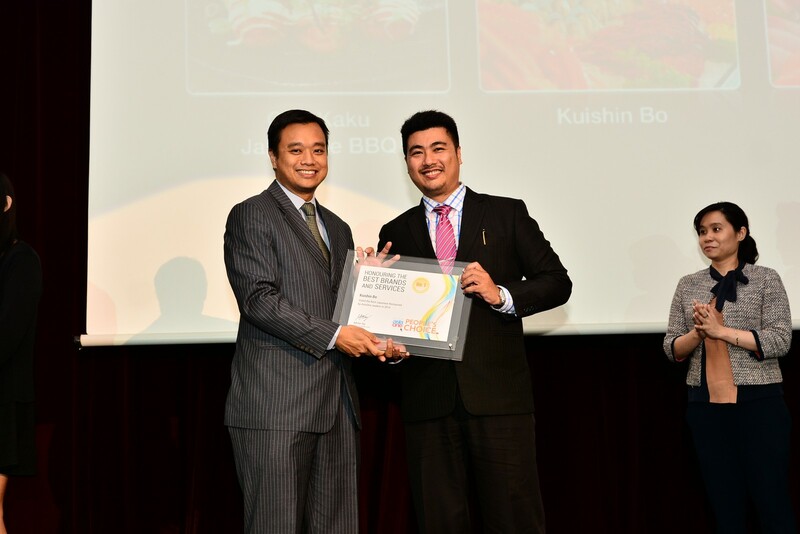 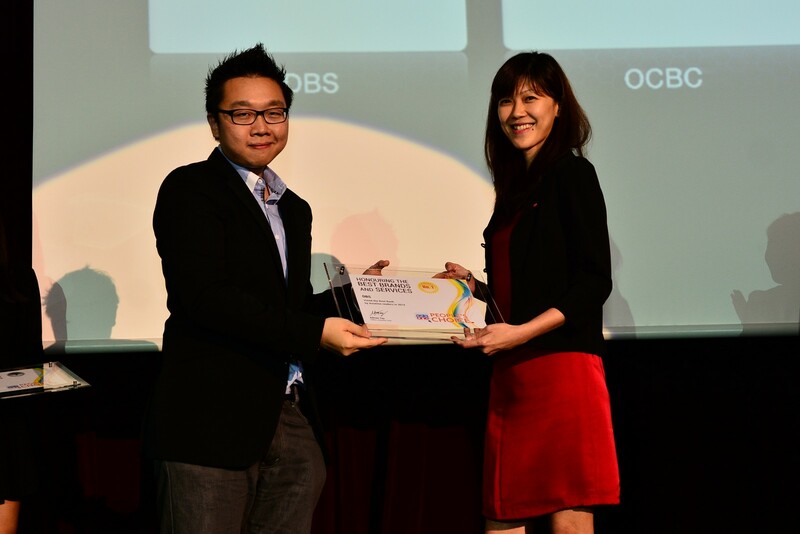 Deputy Head of SPH Digital giving out the awards for the Top 3 Suburban Shopping Centres category. 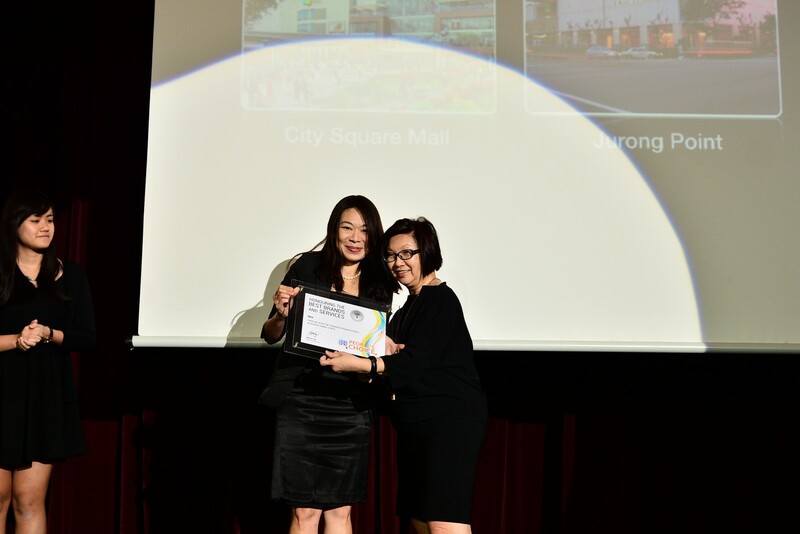 The Best Suburban Shopping Centre award went to City Square Mall. 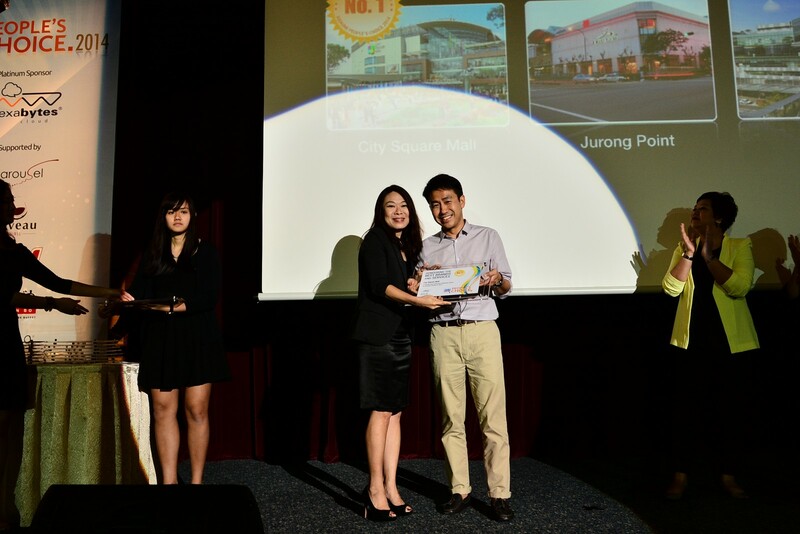 Top 3 Suburban Shopping Centre: Jurong Point. 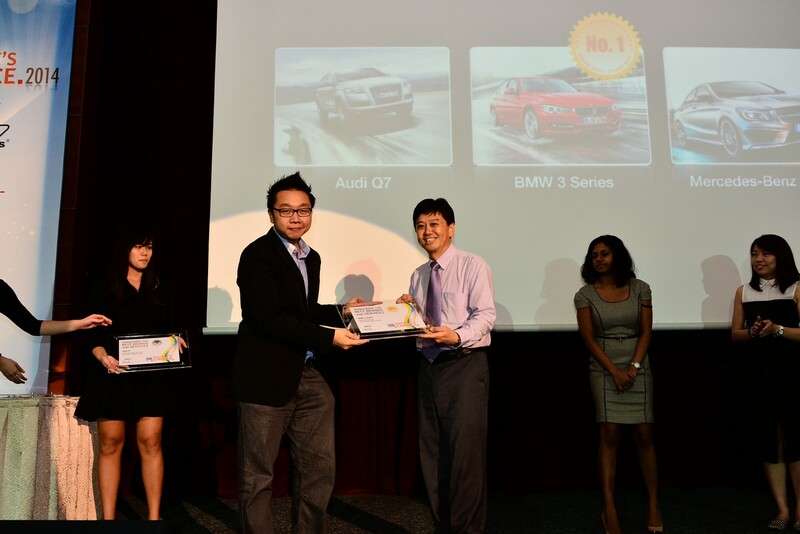 Top 3 Suburban Shopping Centre: nex. 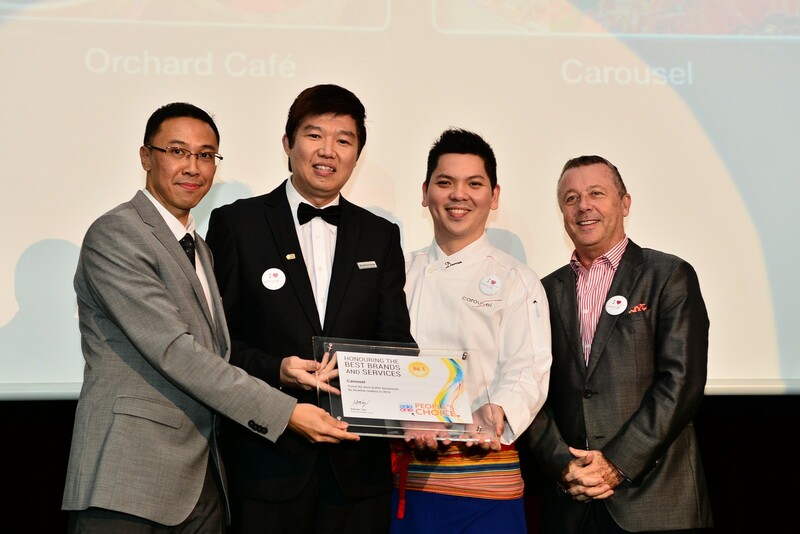 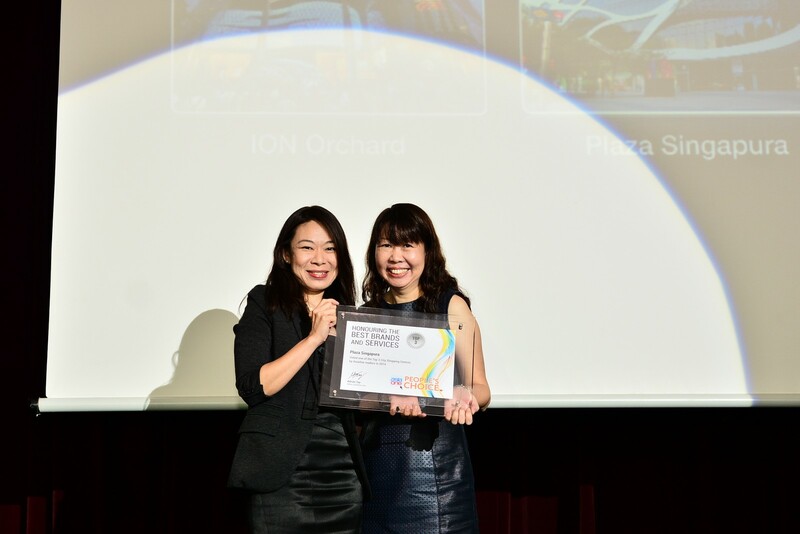 Best City Shopping Centre: ION Orchard. 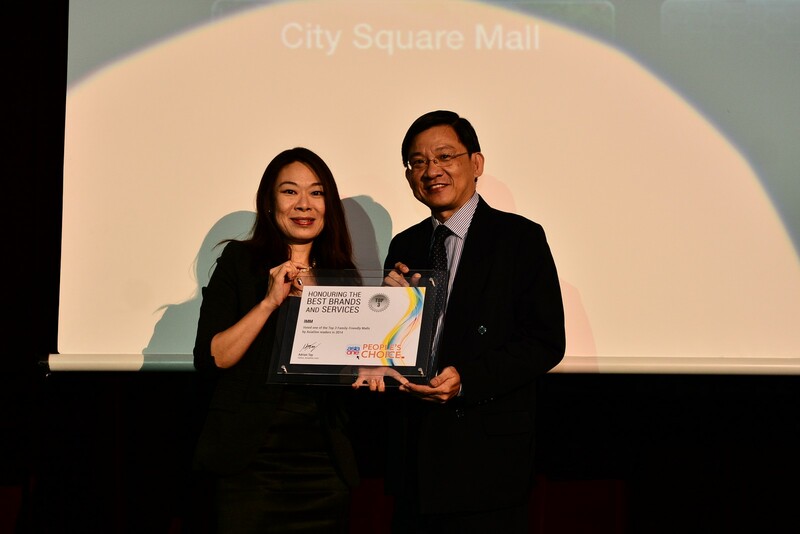 Top 3 City Shopping Centres: Plaza Singapura. 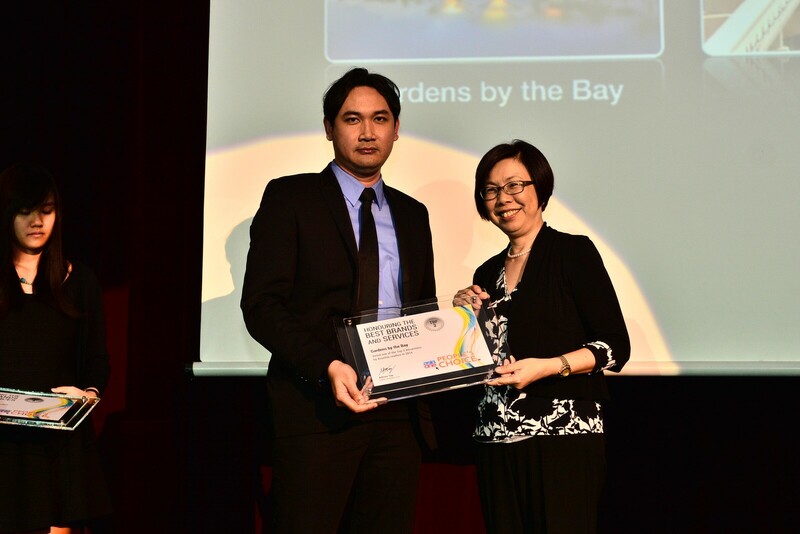 Best City Shopping Centre: VivoCity. 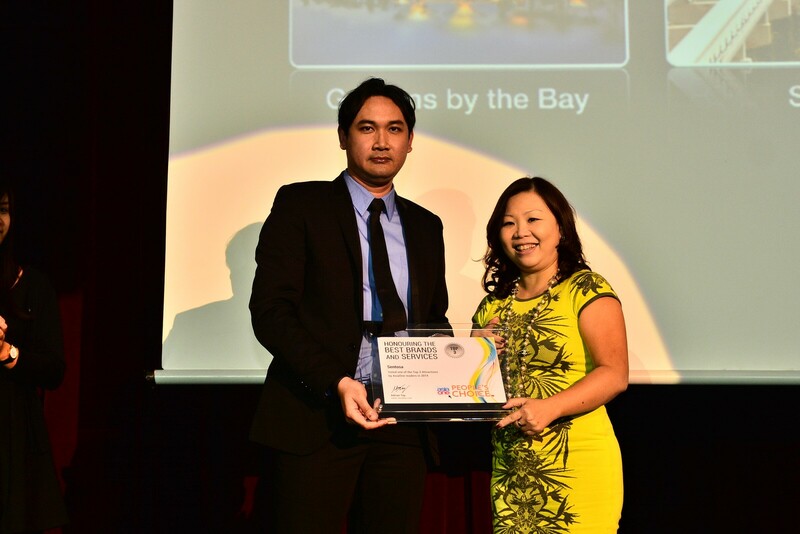 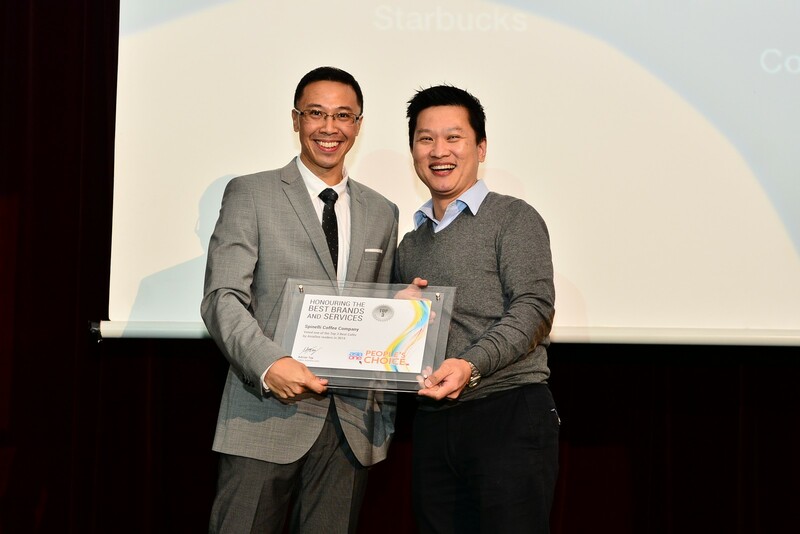 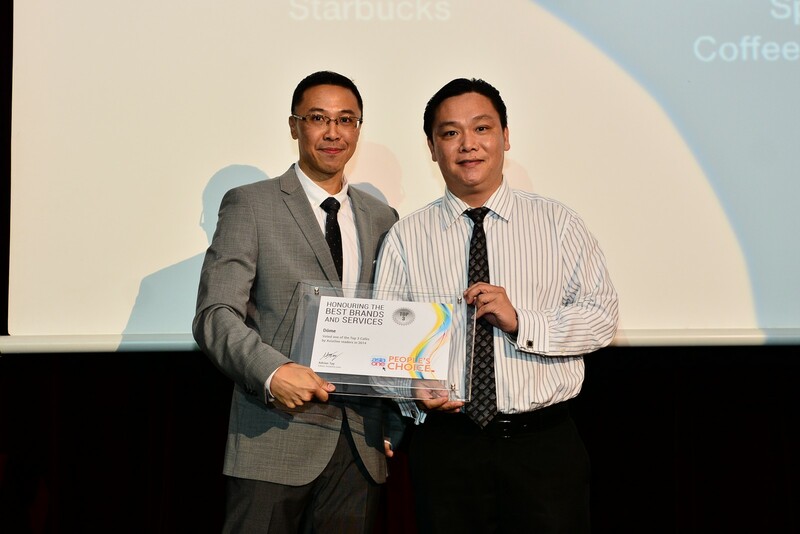 VivoCity won in the next category announced as Best Family-Friendly Shopping Centre. 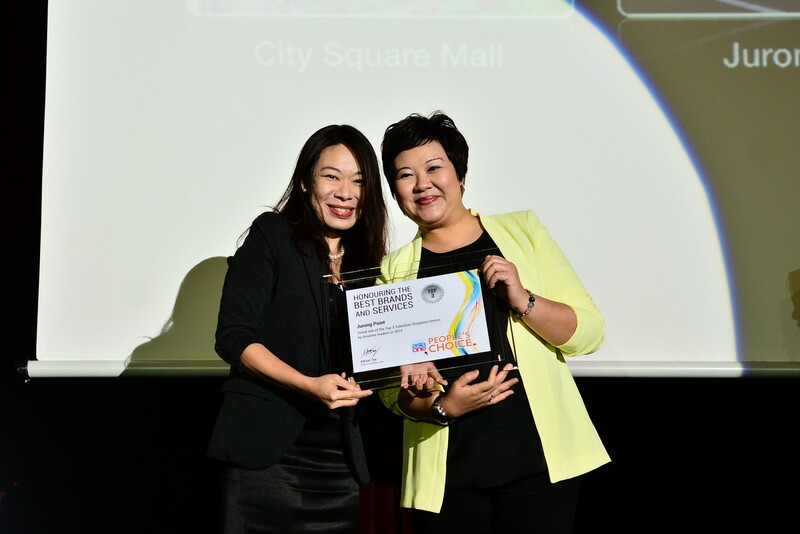 Top 3 Family Friendly Shopping Centres: IMM. 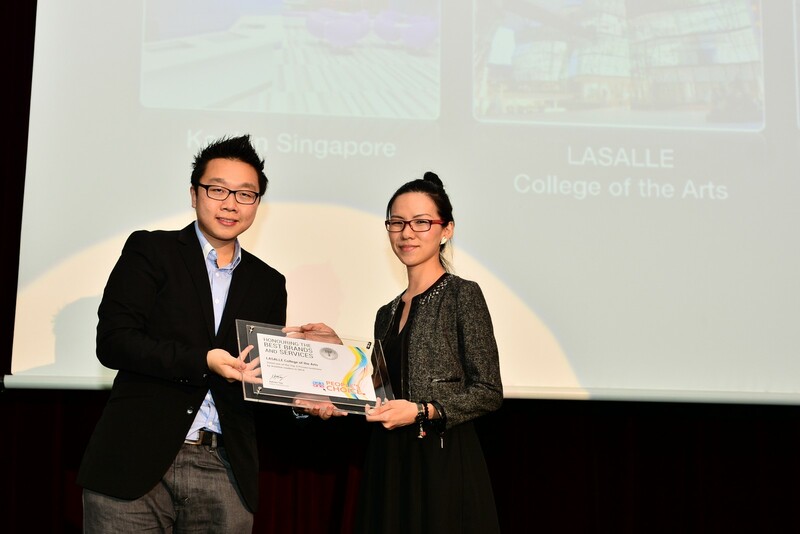 Top 3 Private Institutes: Lasalle College of the Arts. 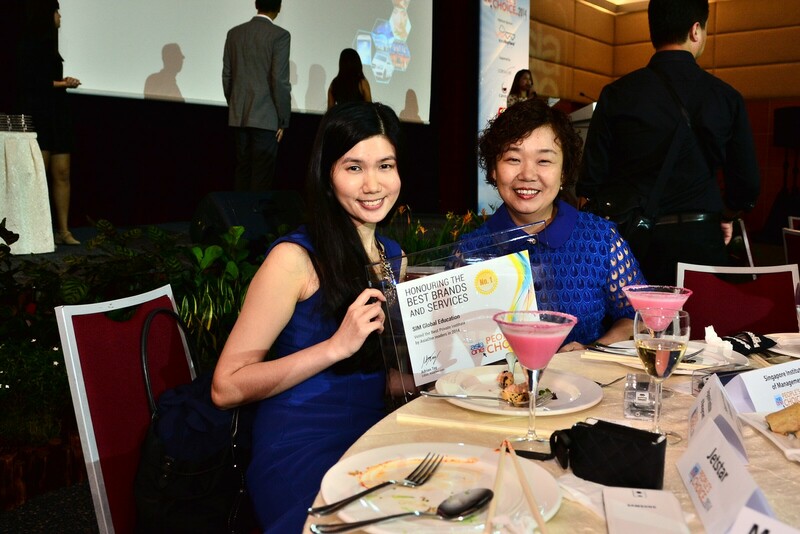 Best Private Institute: SIM Global Education. 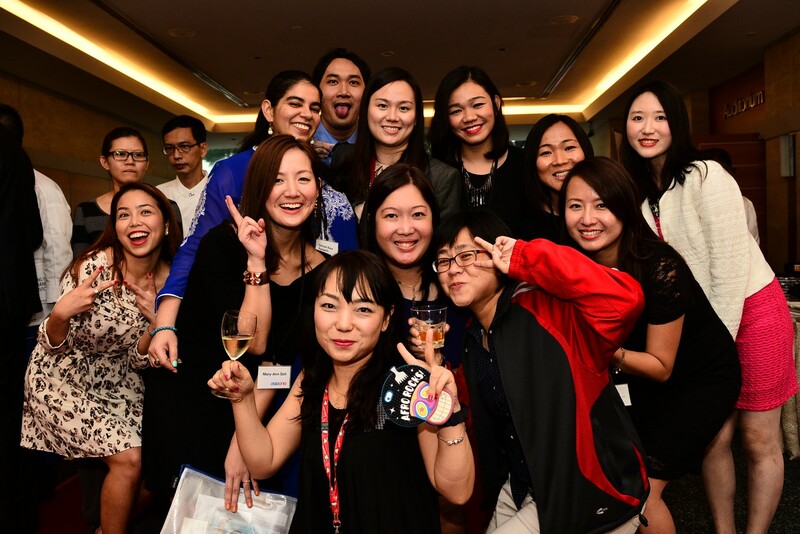 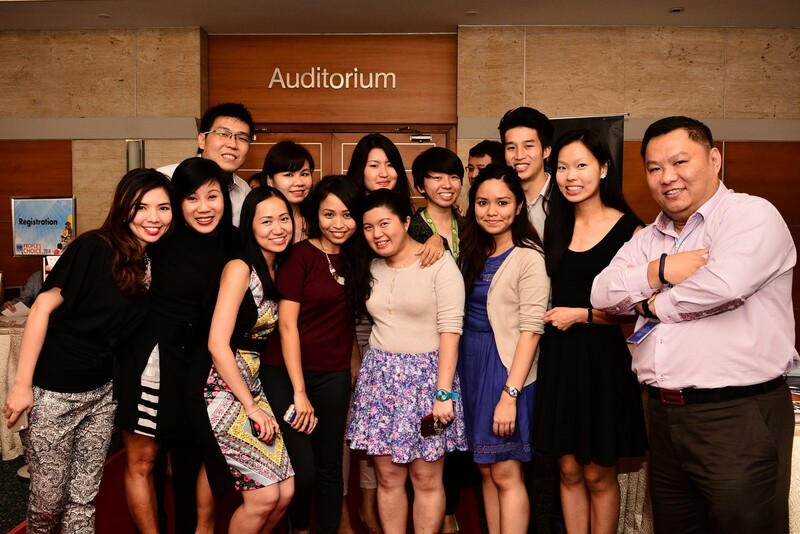 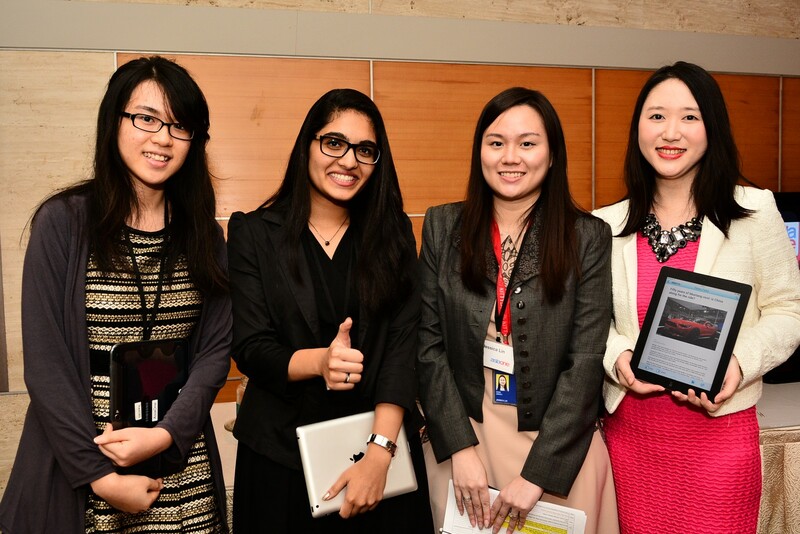 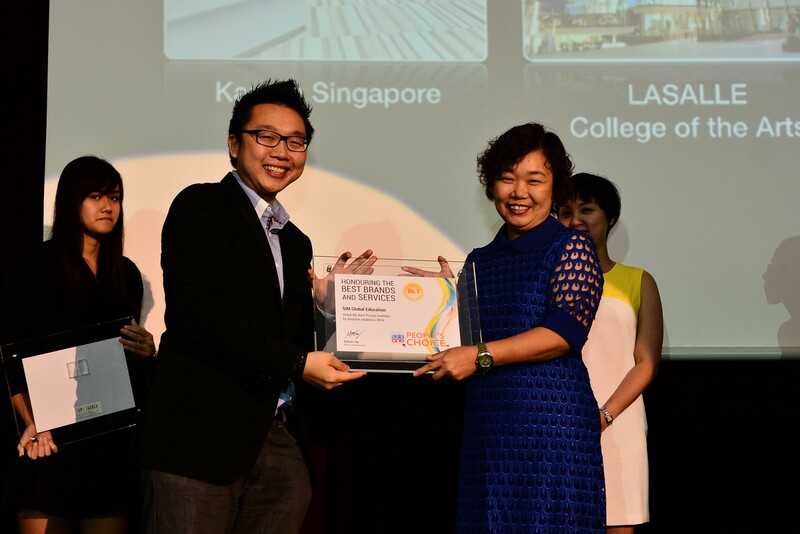 Top 3 Private Institutes: Kaplan Singapore. 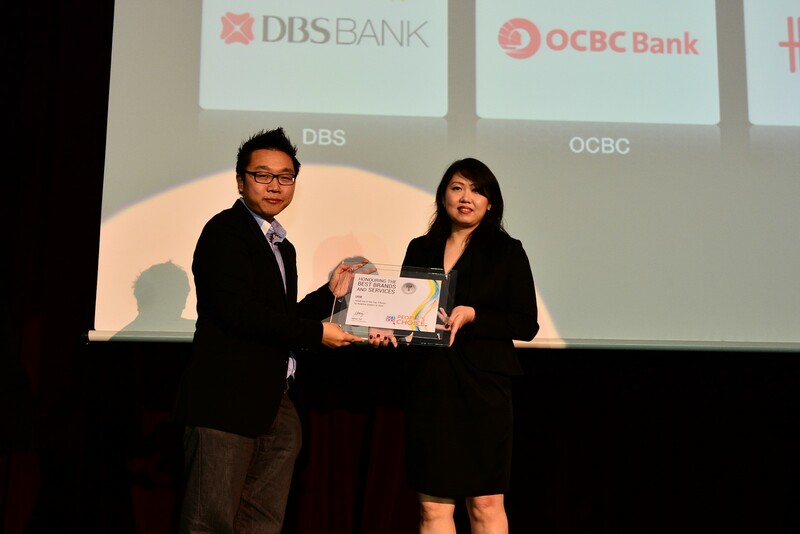 Top 3 Credit/Debit Cards: OCBC NTUC Plus! 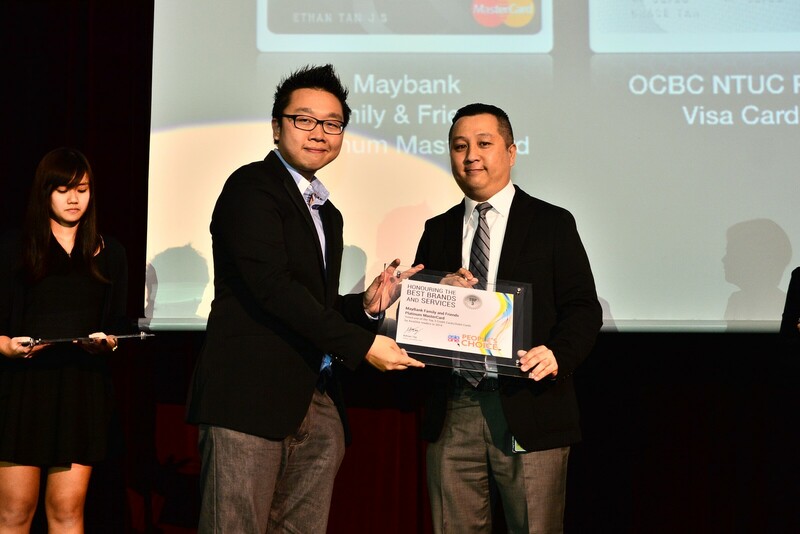 Visa Card. 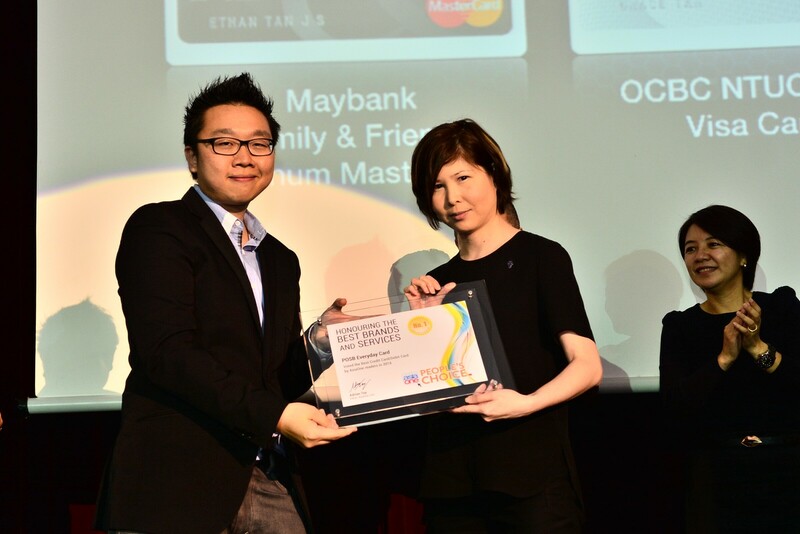 Top 3 Credit/Debit Cards: Maybank Family and Friends Platinum MasterCard. 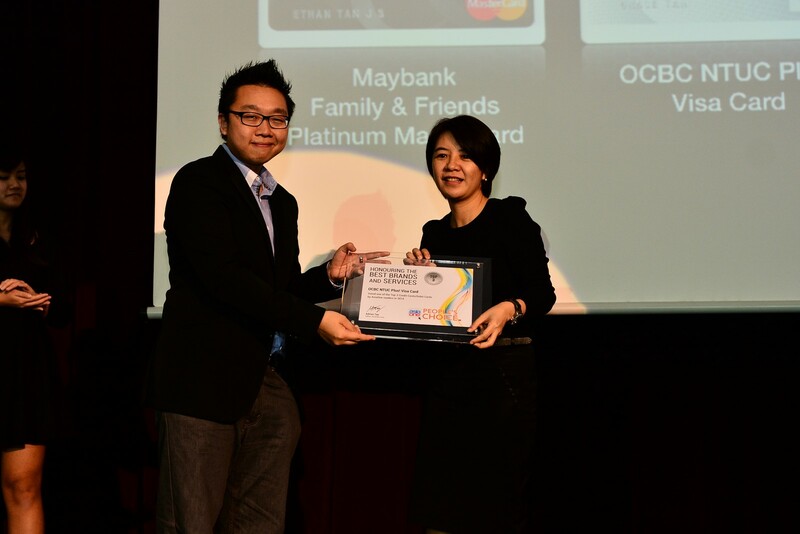 Best Credit/Debit Card: POSB Everyday Card. 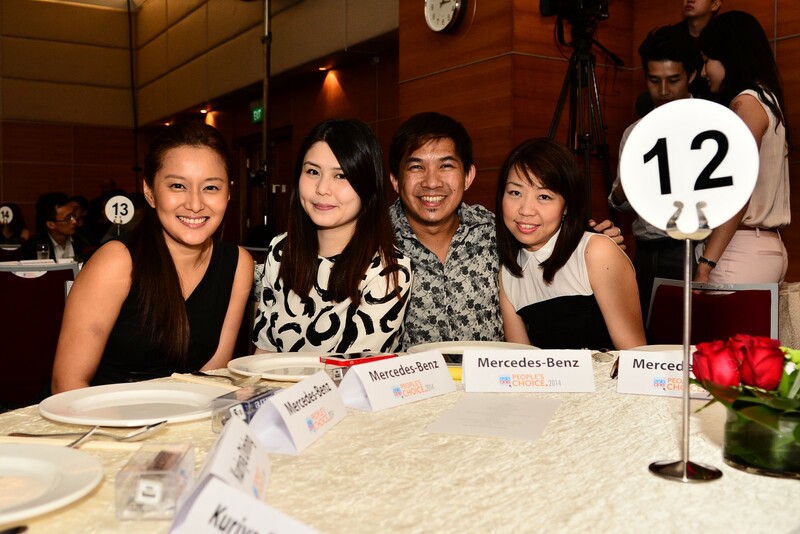 Top 3 Cars: Mercedes-Benz CLA. 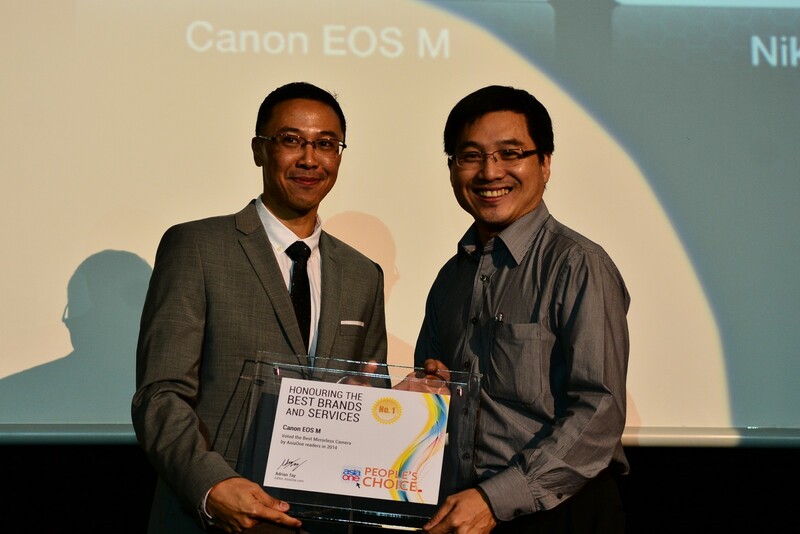 Best Mirrorless Camera: Canon EOS M.
Top 3 Mirrorless Cameras: Nikon 1 J3. 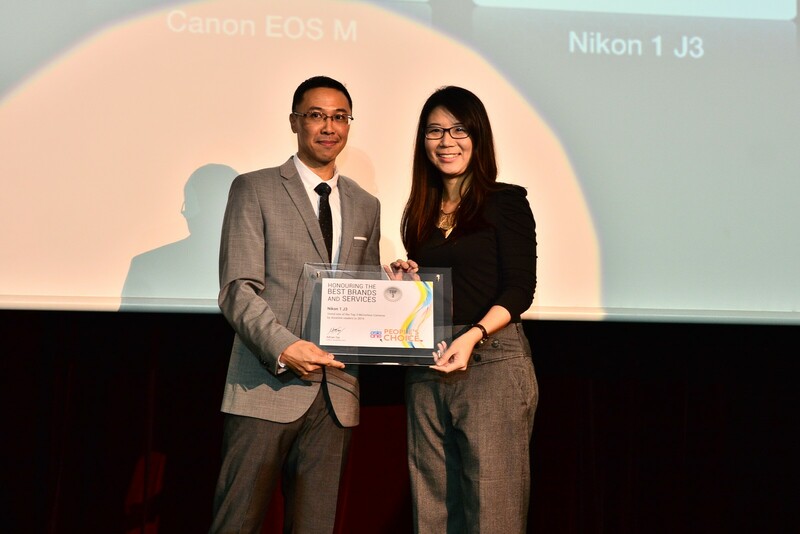 Top 3 Mirrorless Cameras: Olympus PEN Mini E-PM2. 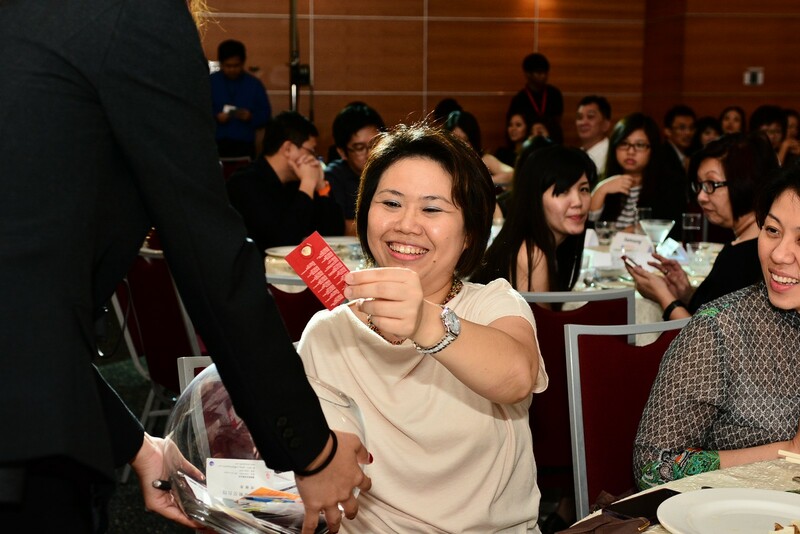 Guest stood to win $1,880 worth of vouchers in the AsiaOne People's Choice Awards lucky draw. 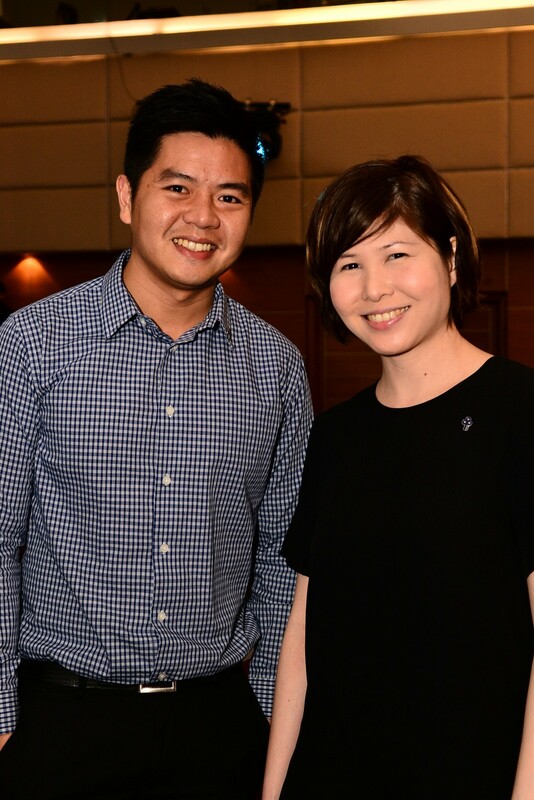 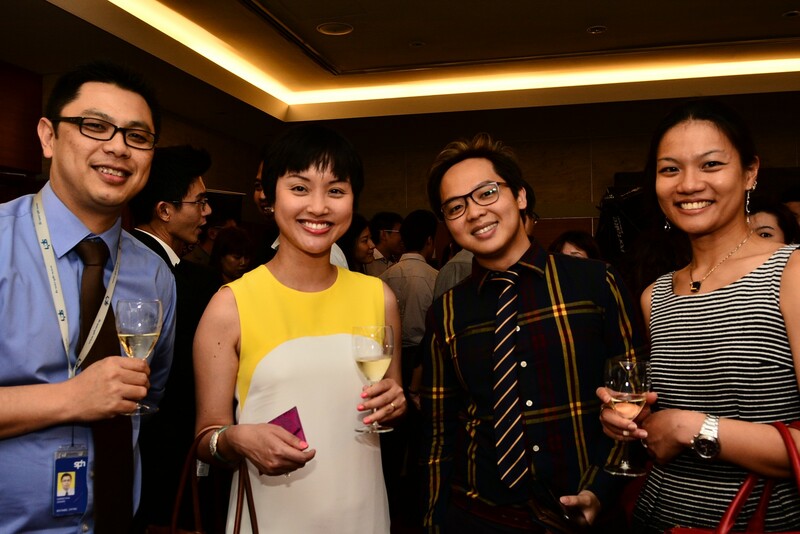 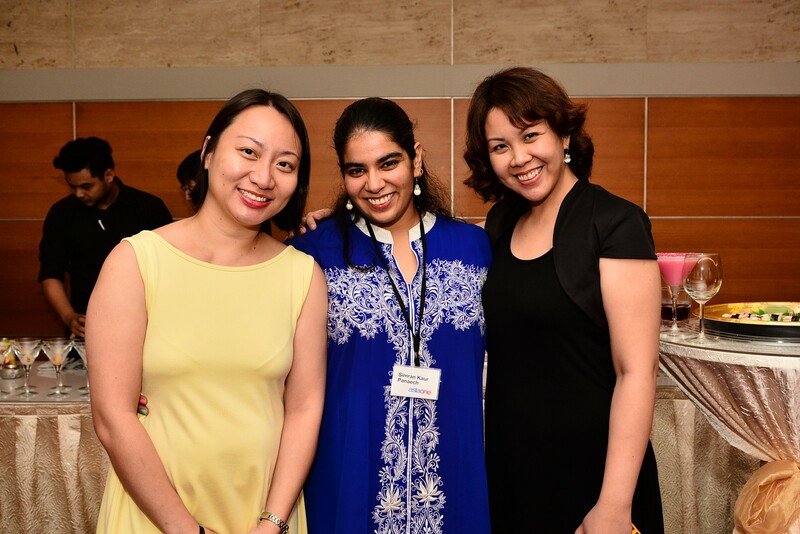 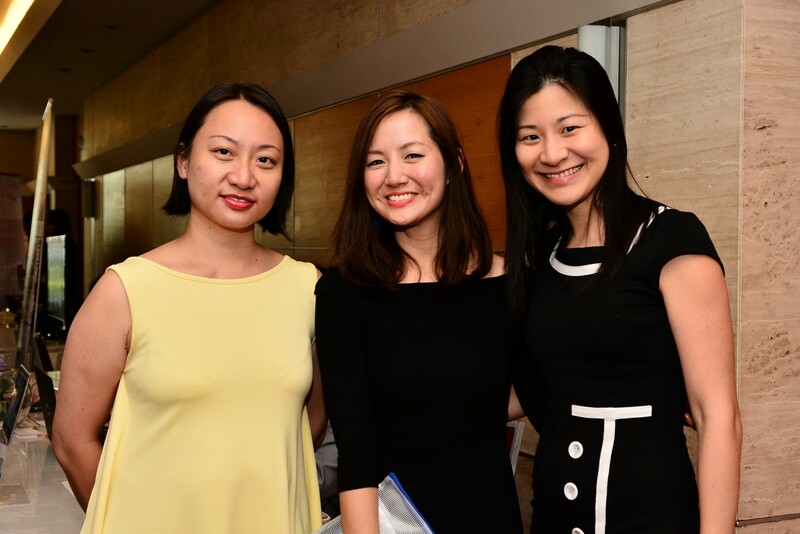 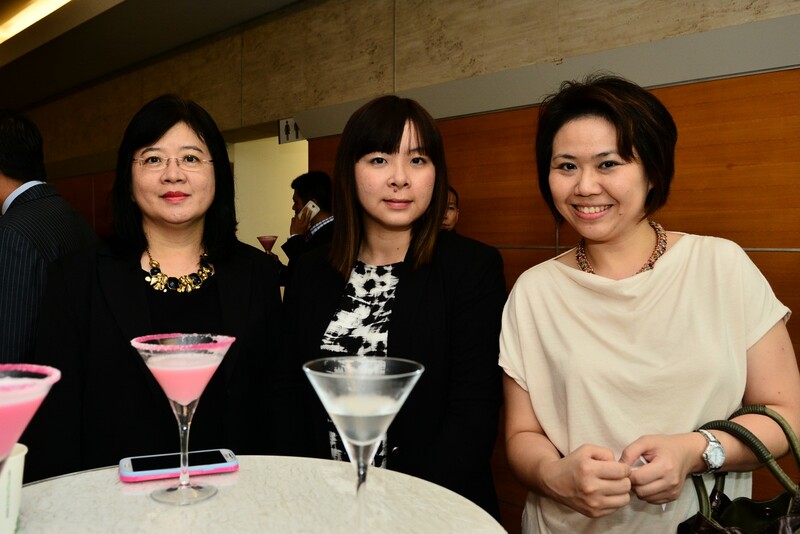 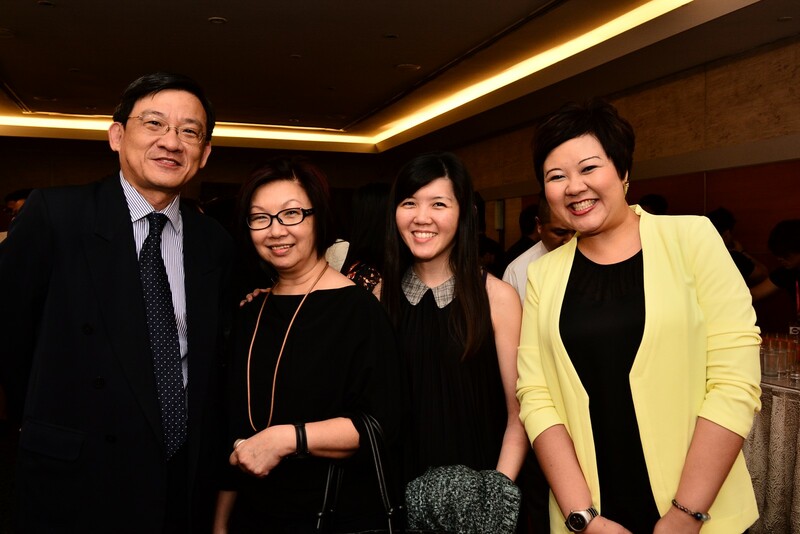 On the far left and left: STOMP editor Azhar Kasman and SPH Razor Deputy Editor Geraldine Teo posing with host Charmaine Yee. 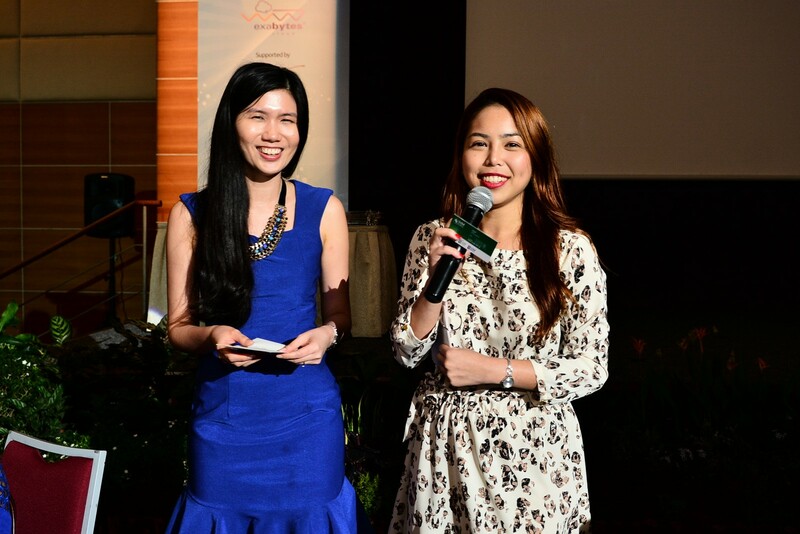 Host Charmaine Yee giving out $200 worth of vouchers to each winner. 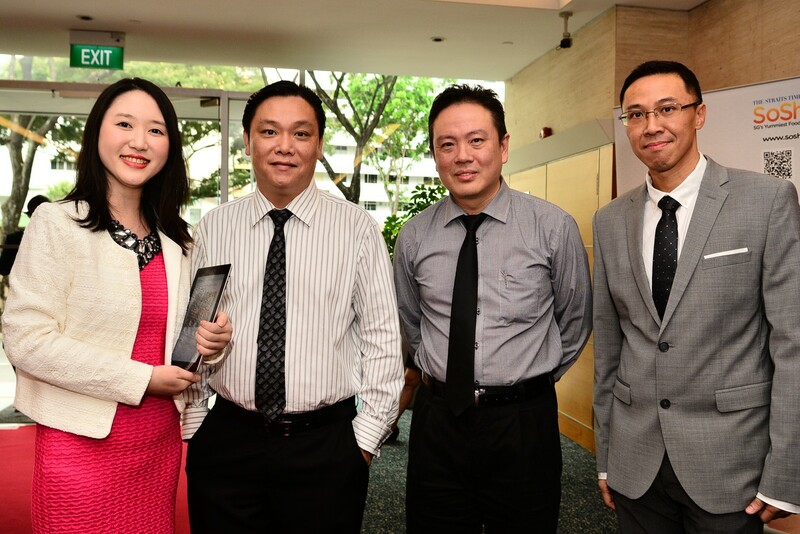 Top 3 Tablets: Samsung Galaxy Tab 10.1. 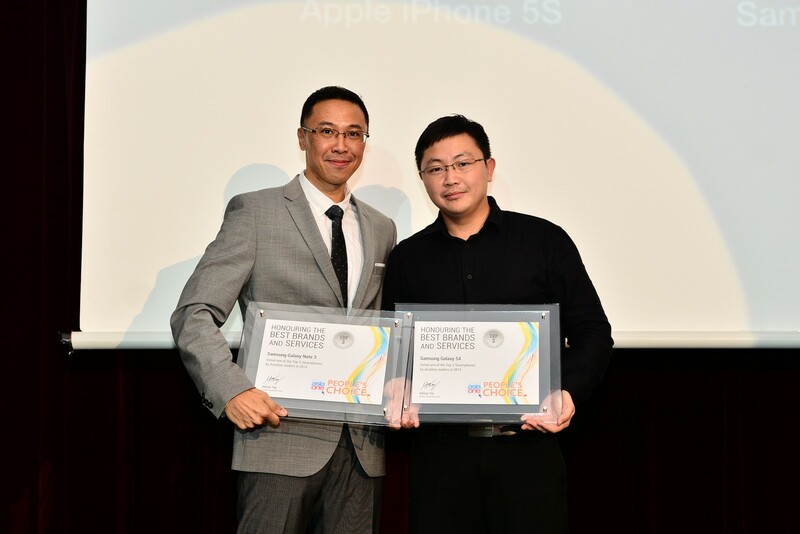 Top 3 Smartphones: Samsung Galaxy Note 3 and Galaxy S4. 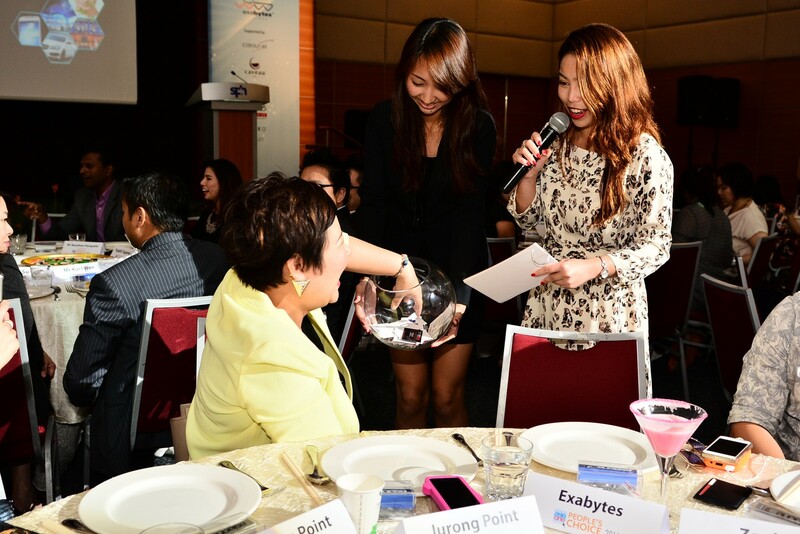 Charmaine Yee conducting the lucky draw. 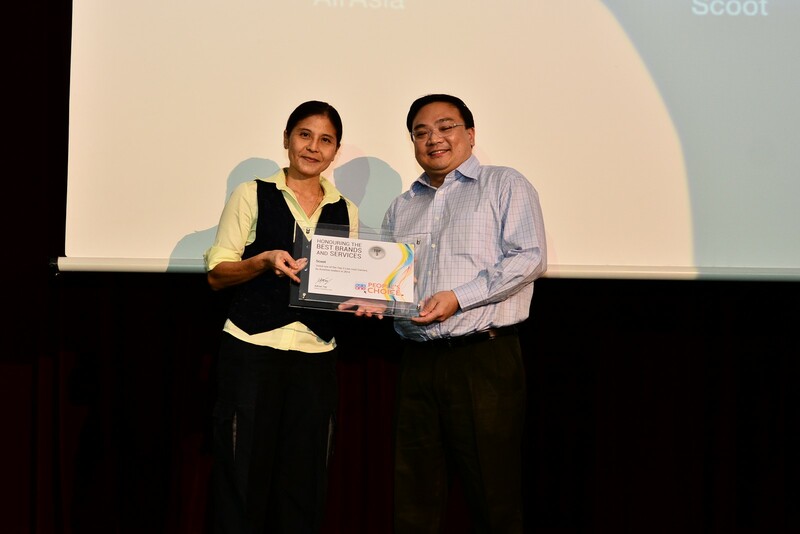 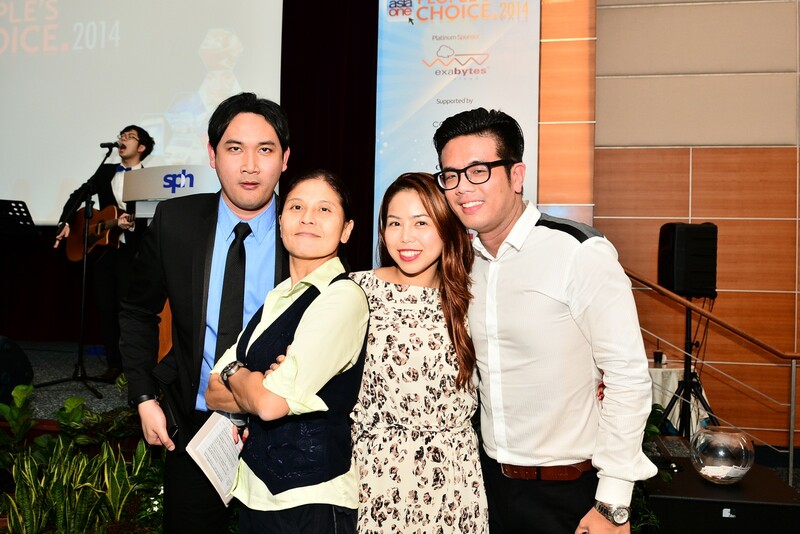 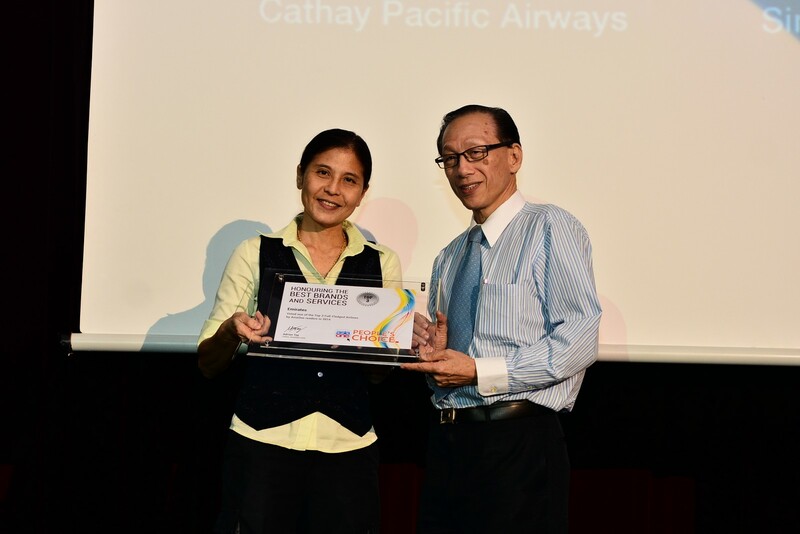 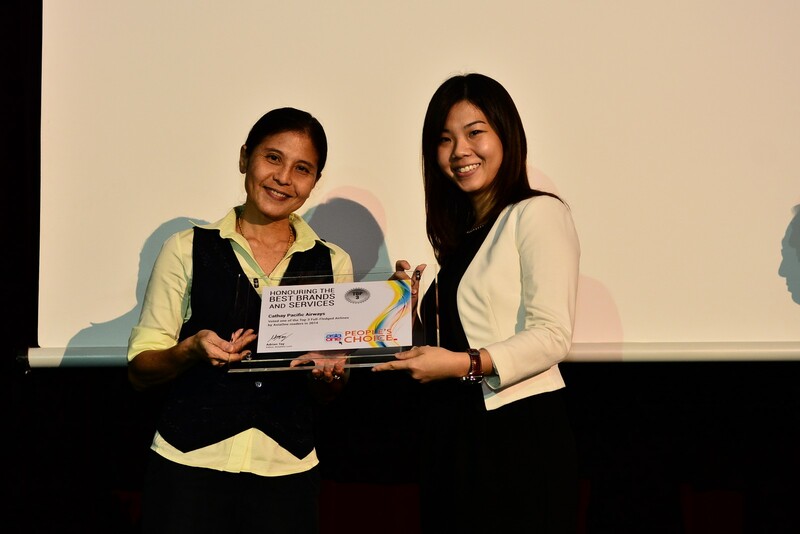 SPH Razor Deputy Editor Geraldine Teo giving out the Best Low-cost Carrier award to Jetstar Asia Airways. 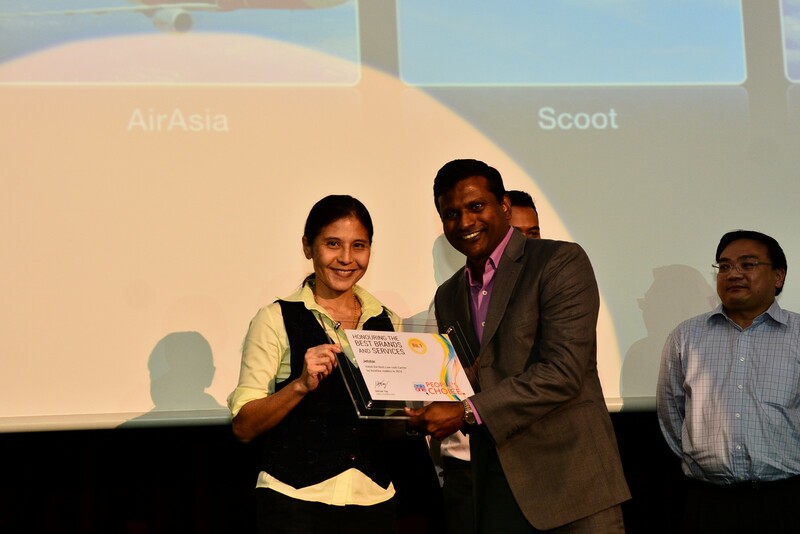 Top 3 Low-cost Carriers: Scoot. 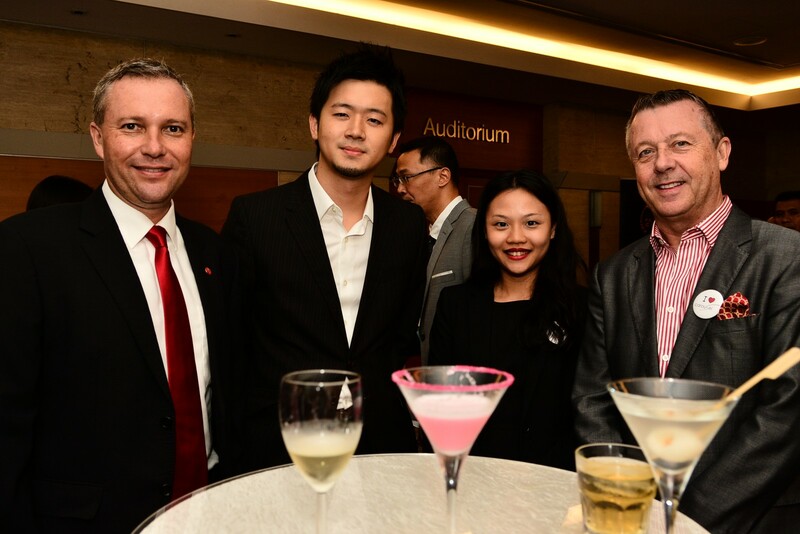 Top 3 Full-Fledged Airlines: Emirates. 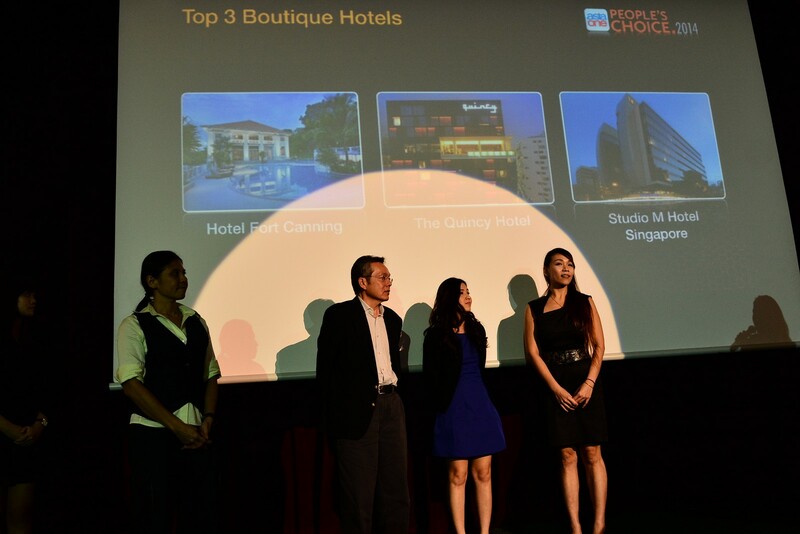 Best Boutique Hotel: Studio M Hotel Singapore. 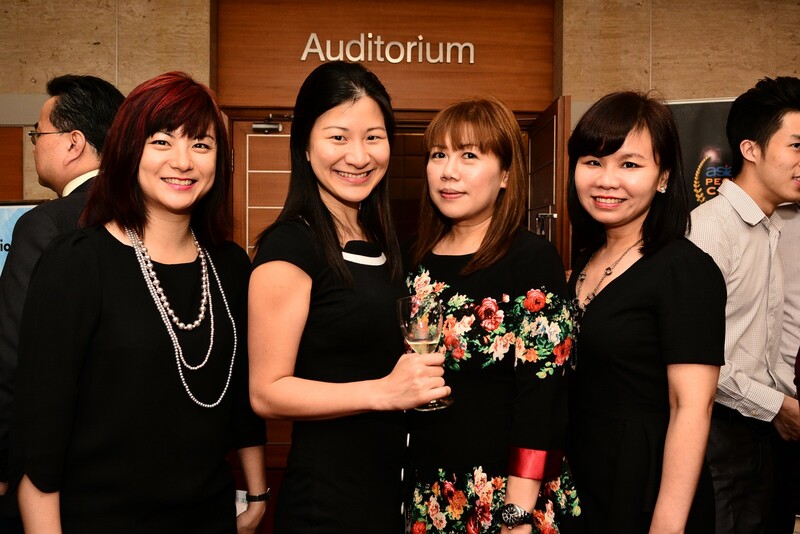 Top 3 Boutique Hotels: Hotel Fort Canning. 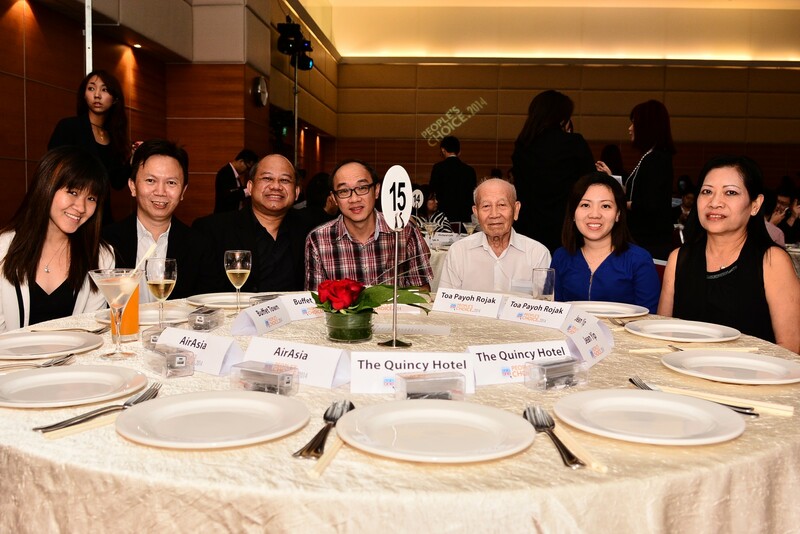 Top 3 Boutique Hotels: The Quincy Hotel. 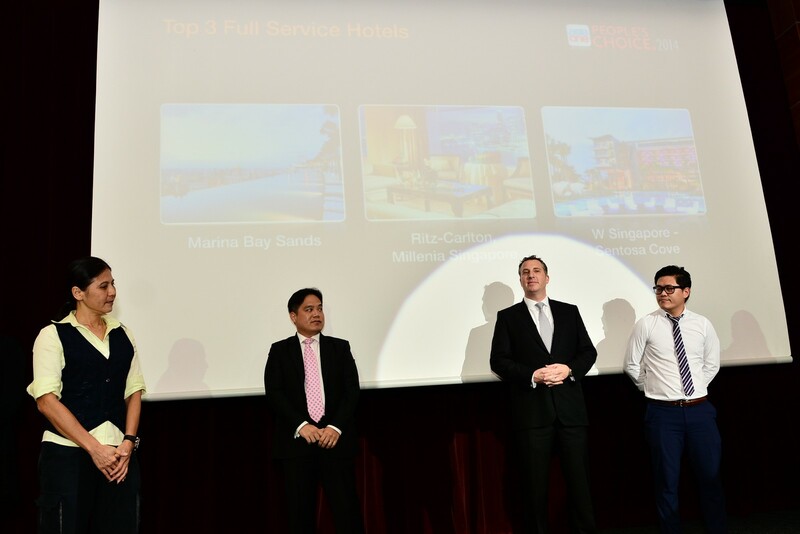 Top 3 Full-Service Hotels: Marina Bay Sands, Ritz-Carlton Millenia Singapore, W Singapore Sentosa Cove. 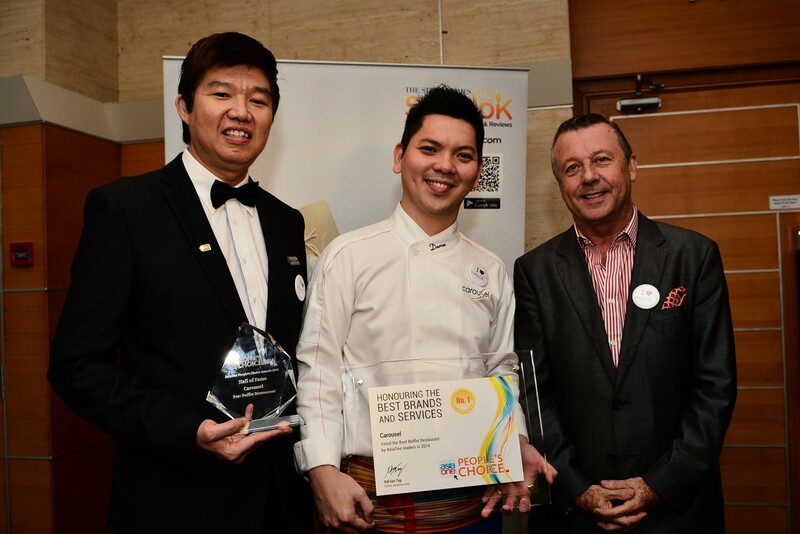 Best Full Service Hotel: Marina Bay Sands. 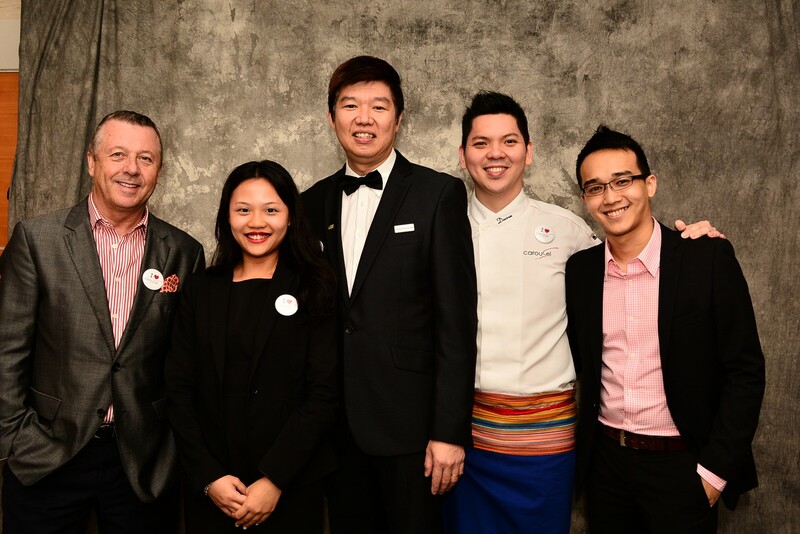 Top 3 Full Service Hotels: The Ritz-Carlton, Millenia Singapore. 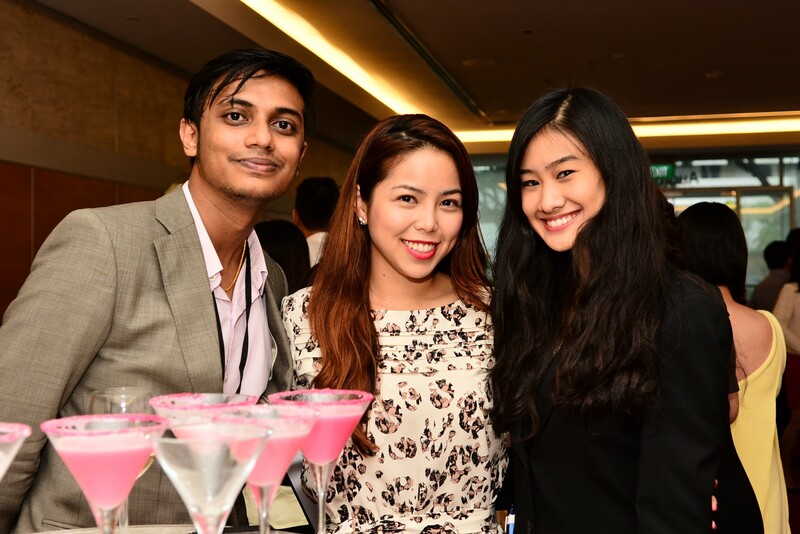 Top 3 Nightspots: Zouk, Clarke Quay, St James Power Station. 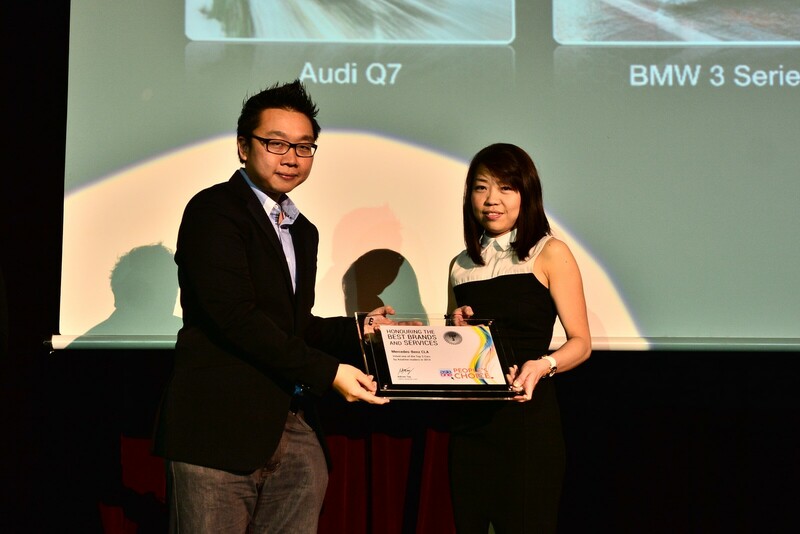 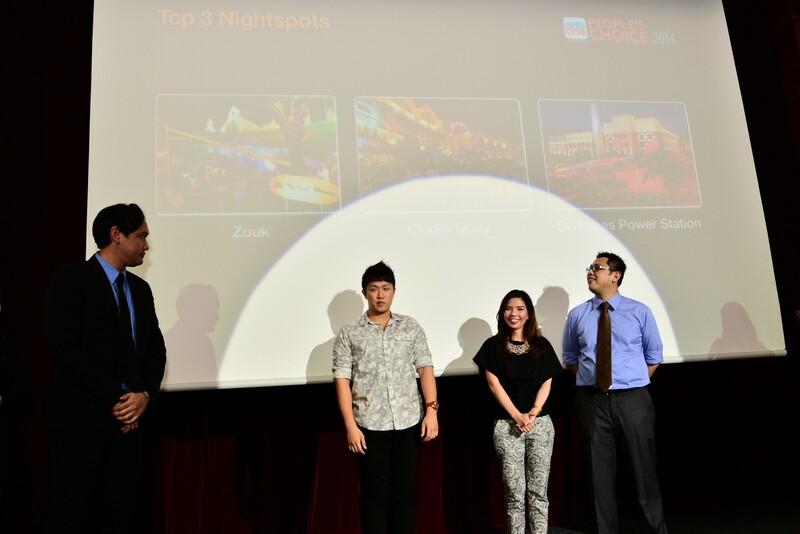 The Best Nightspot award went to Clarke Quay. 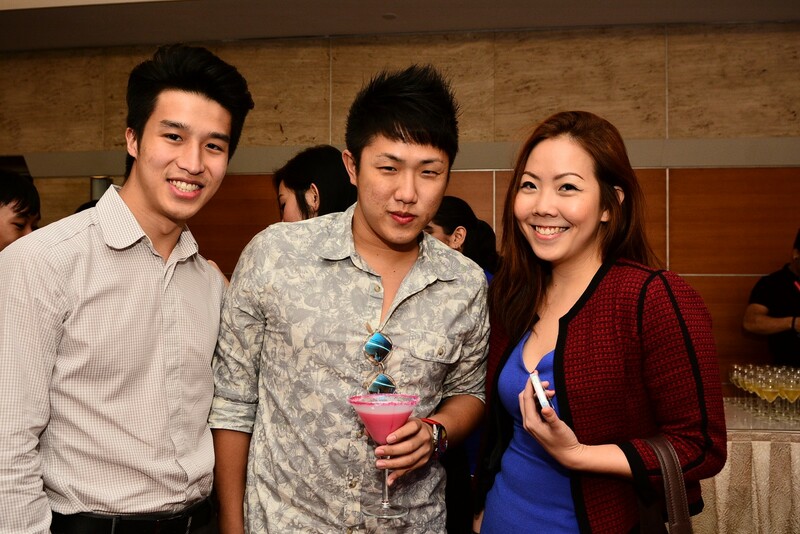 Top 3 Nightspots: St James Power Station. 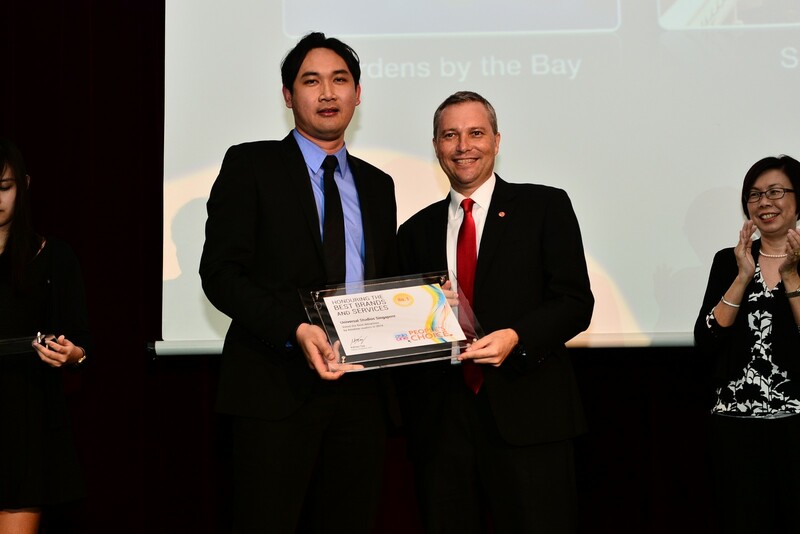 Top 3 Attractions: Gardens By The Bay. 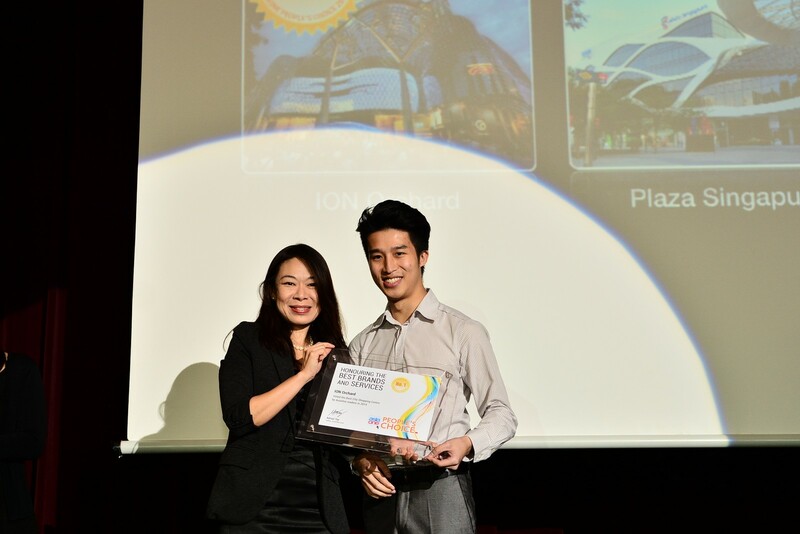 Best Attraction: Universal Studios Singapore. 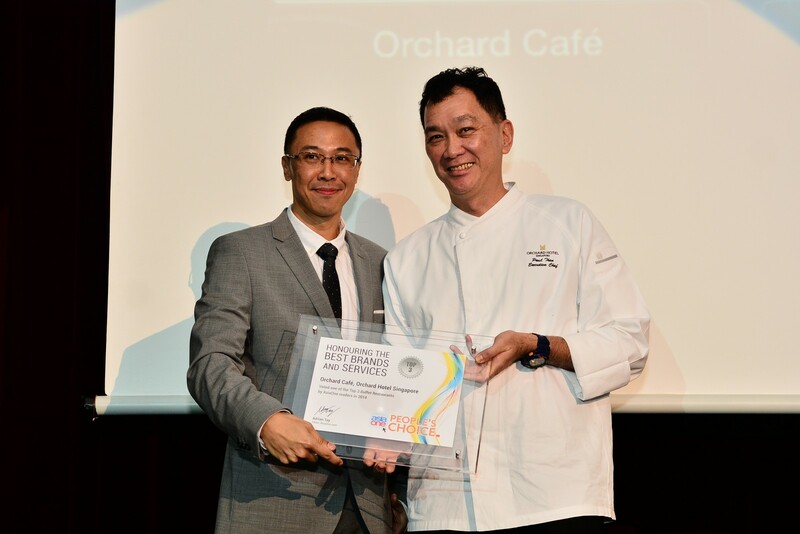 Top 3 Buffet Restaurants: Orchard Cafe, Orchard Hotel Singapore. 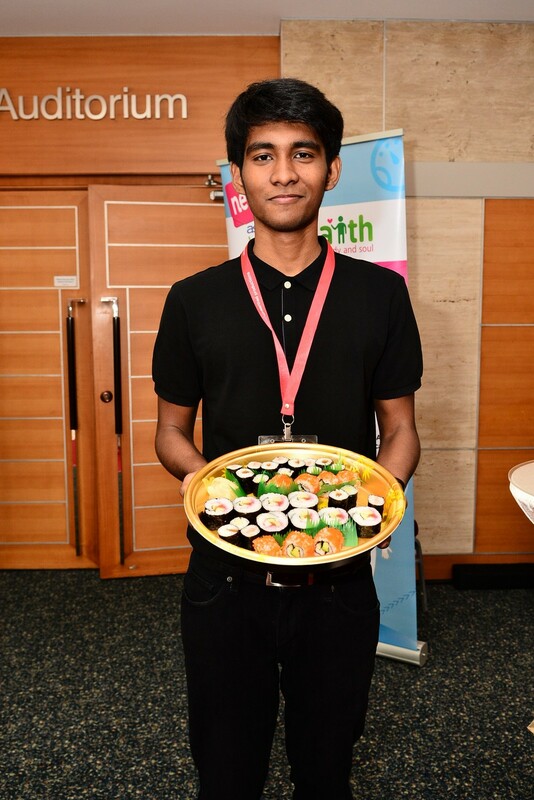 Top 3 Buffet Restaurants: Buffet Town. 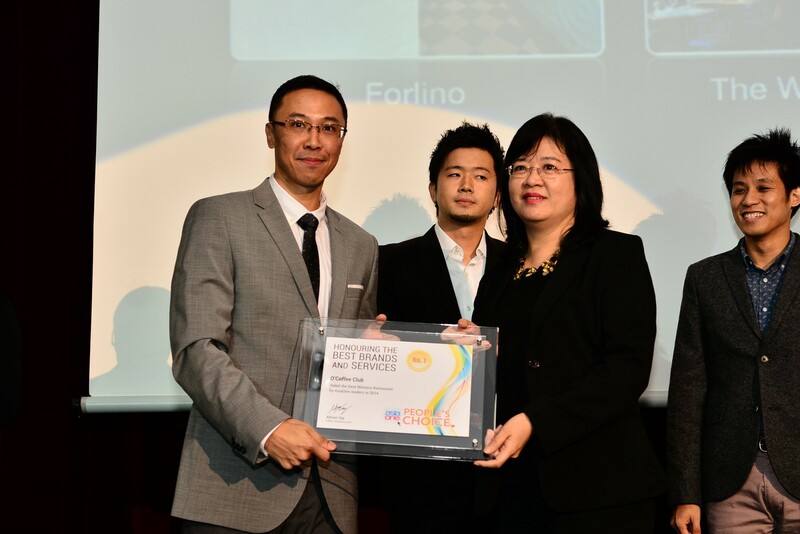 Top 3 Western Restaurants: Forlino. 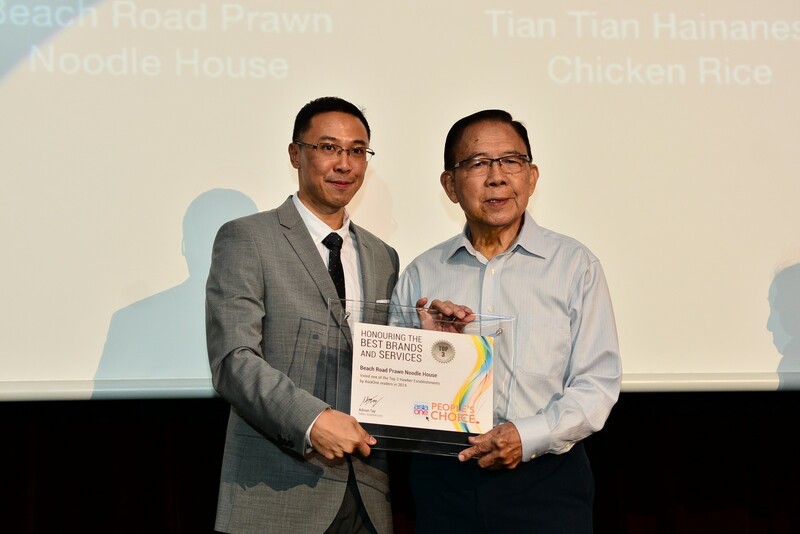 Best Hawker Establishment: Tian Tian Chicken Rice. 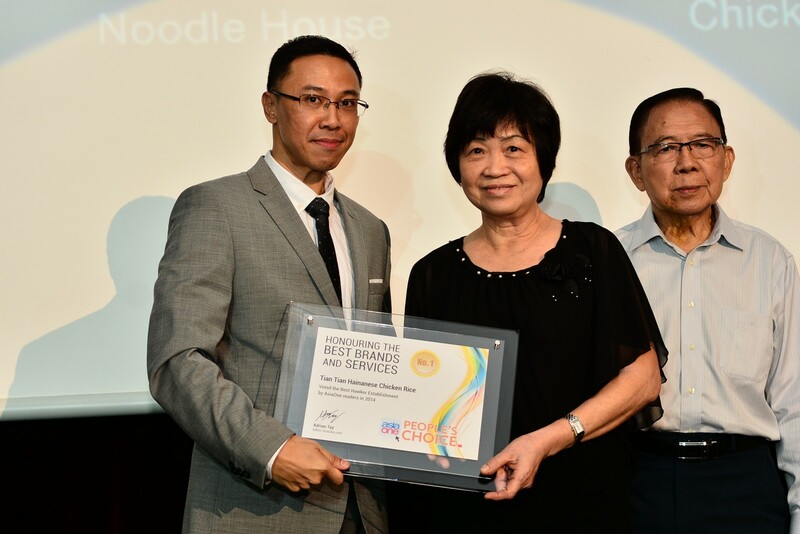 Top 3 Hawker Establishments: Toa Payoh Rojak. 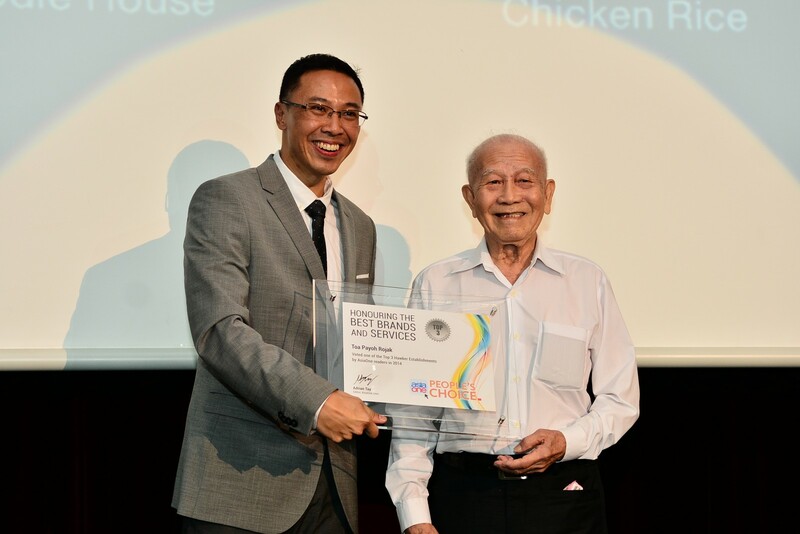 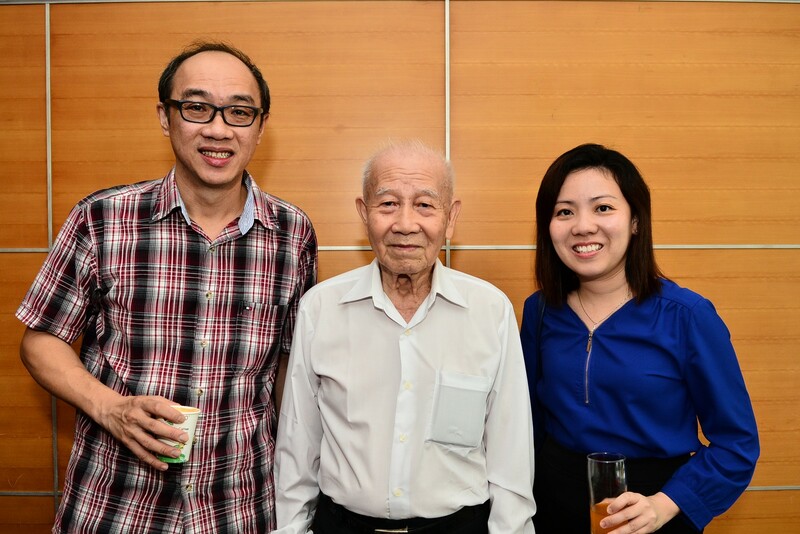 Last year's Best Hawker winner Toa Payoh Rojak received the loudest cheers when 83-year-old Mr Cheng Kong Sang received his award. 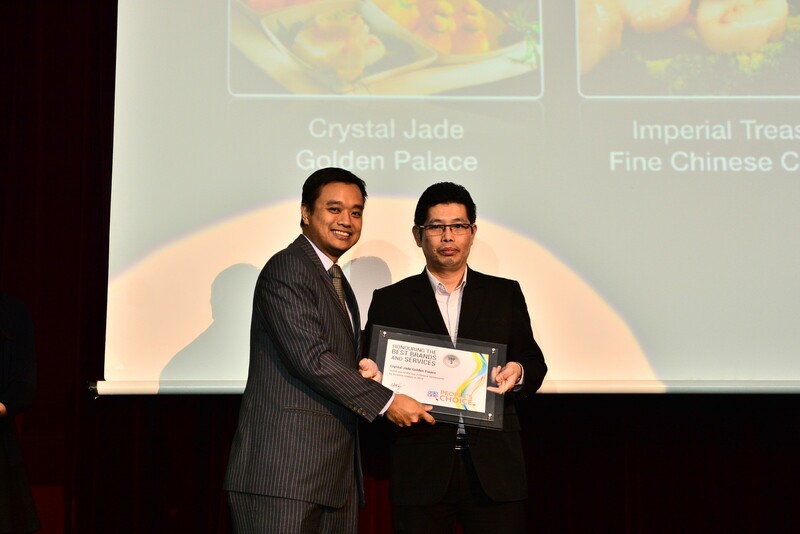 Top 3 Chinese Restaurants: Crystal Jade Golden Palace. 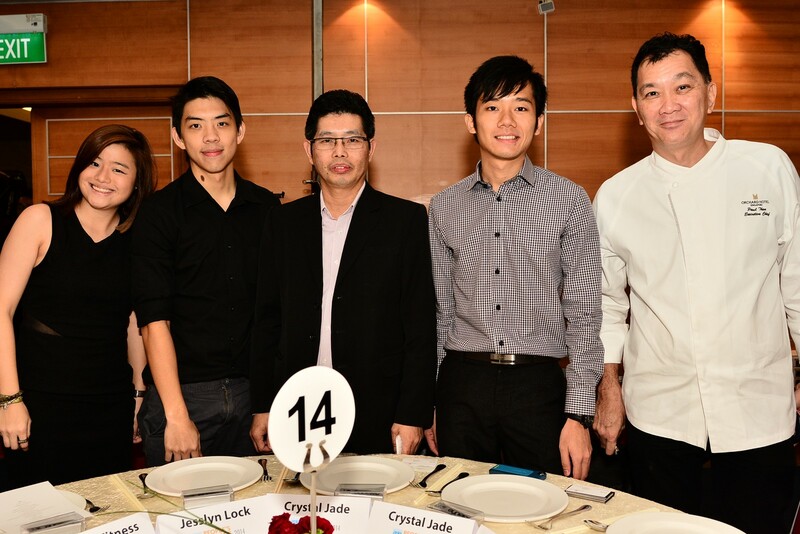 Top 3 Asian Restaurants: 4 Fingers Crispy Chicken. 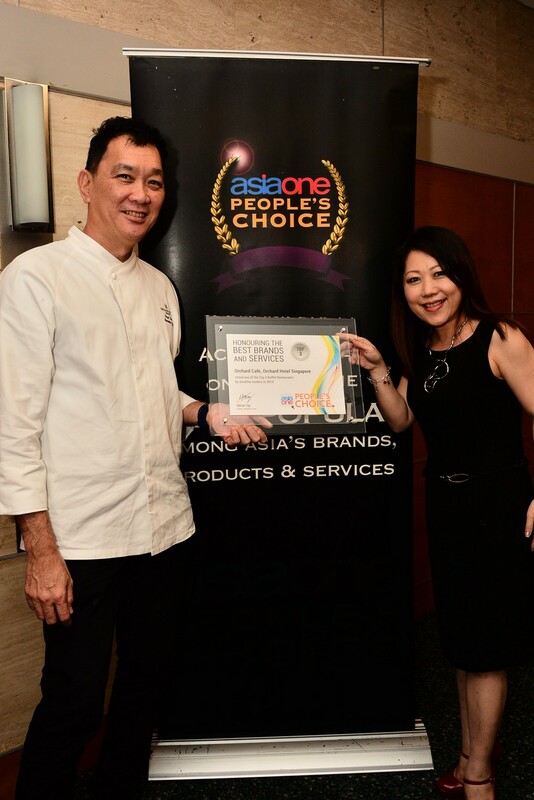 Top 3 Asian Restaurants: The Banana Leaf Apolo. 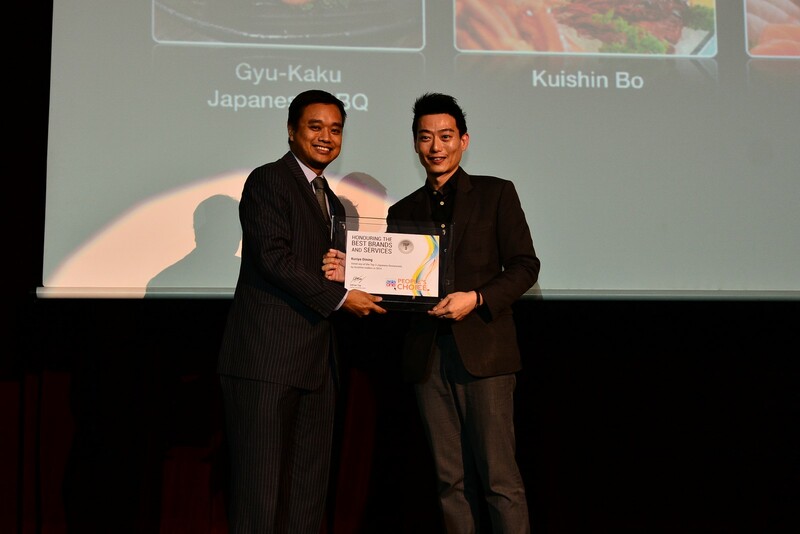 Best Japanese Restaurant: Kuishin Bo. 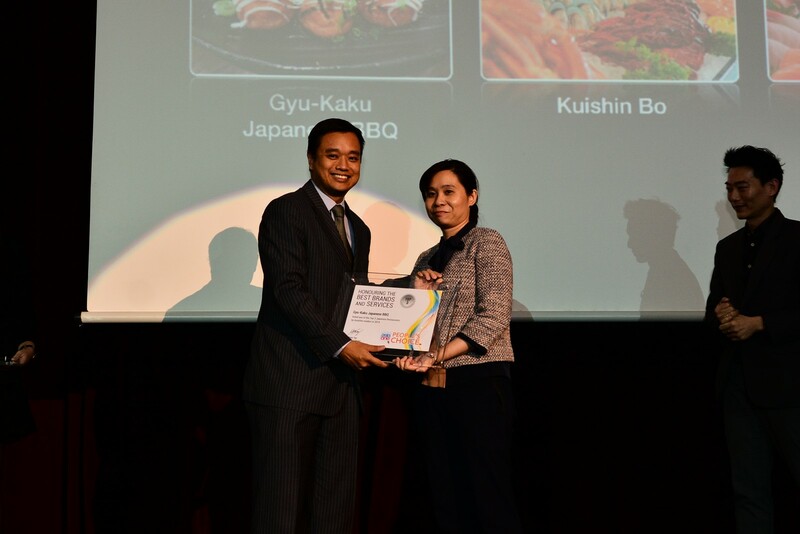 Top 3 Japanese Restaurants: Gyu-Kaku Japanese BBQ. 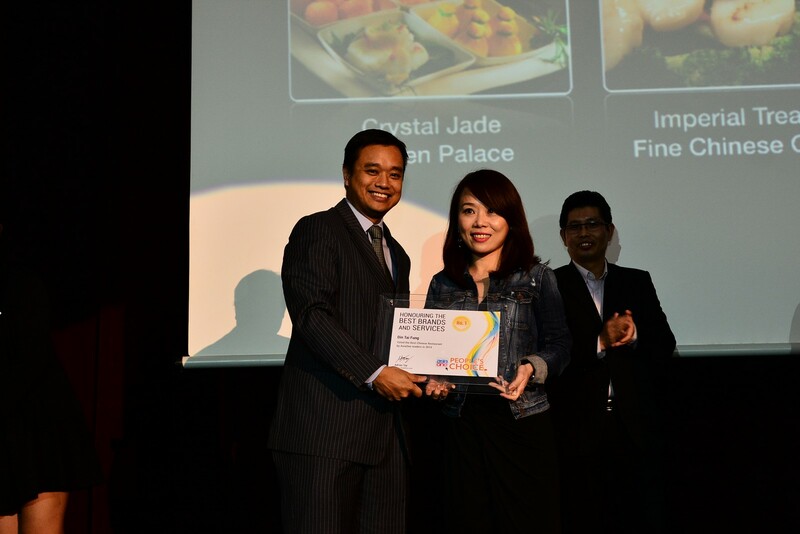 Top 3 Chinese Restaurants: Imperial Treasure Fine Chinese Cuisine.